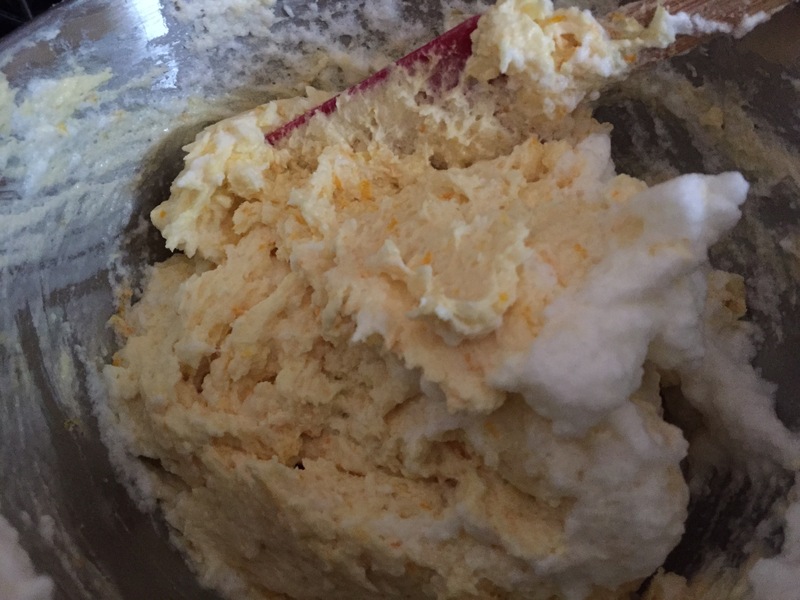 Beat butter and shortening with an electric mixer on medium to high speed until light, fluffy, and pale yellow. This takes 1 – 3 minutes. Make sure to scrape sides and bottom of bowl at least once during this time. Add in about half of the flour, then the egg, sugar, milk, baking powder, vanilla, and salt. 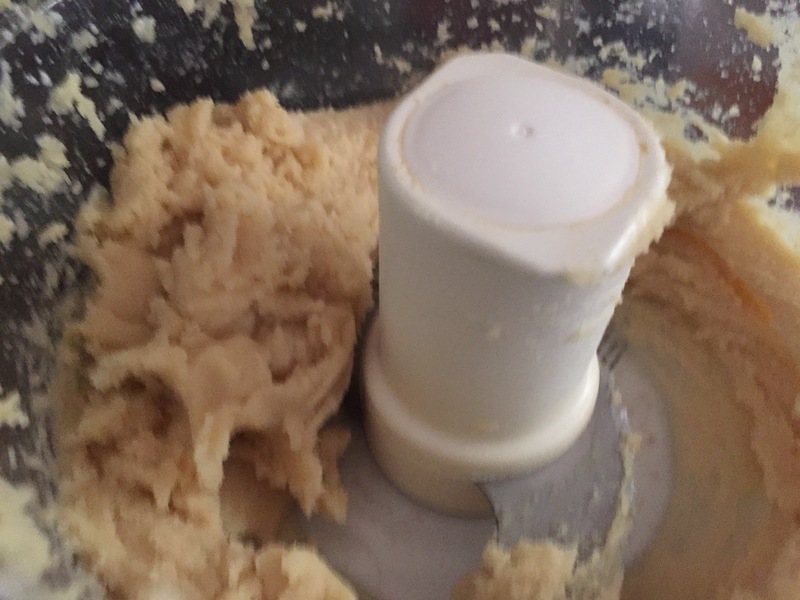 On a lightly floured surface, roll half of the dough at a time to 1/4 inch thick (1/8 inch if you like crispier sugar cookies). 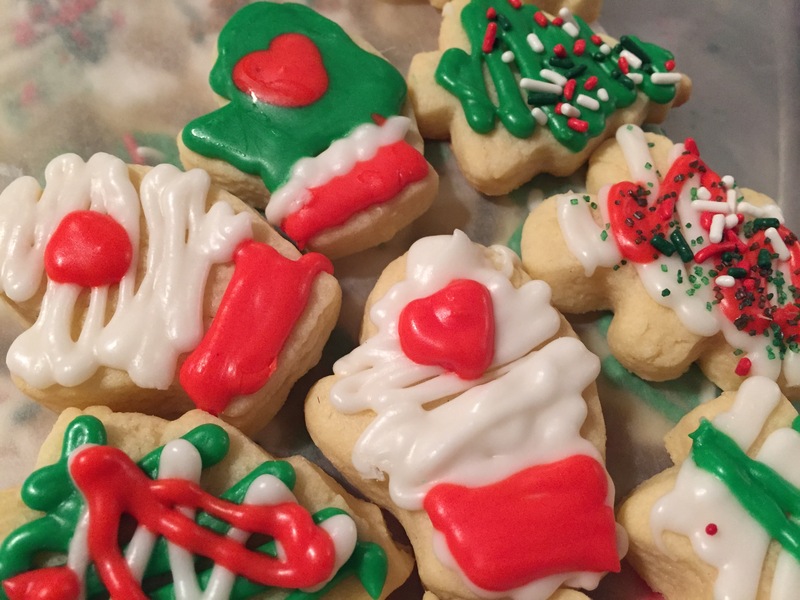 Cut into desired shapes with a 2 1/2 inch cookie cutter. I think the smaller 1 1/2 inch ones are cuter because they make a 2-bite cookie. Which means you can eat more. Place on a cookie sheet lined with parchment. The lighter colored the cookie sheet, the less browned and softer the cookies will be, should you be like me and prefer a chewier sugar cookie. Bake cookies for 7 – 8 minutes or until barely golden around edges on bottom. Let them get slightly more lightly-browned if you like that crispier cookie. Frost with icing then decorate like crazy with holiday sprinkles! The icing that the BH&G cookbook recommends is as follows. This is fine if you are going to whip up a batch on a weekend without decorating for a holiday. 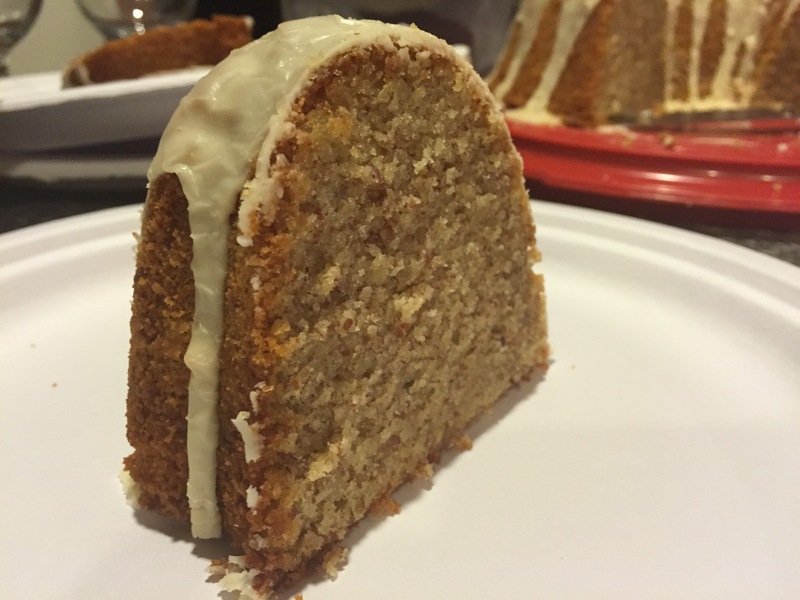 The orange icing is especially nice for a change of pace. But, this frosting is almost more of a glaze than an icing, so it doesn’t work for creating a decorated style. It will, however, hold sprinkles just fine. Mix together powdered sugar and vanilla. 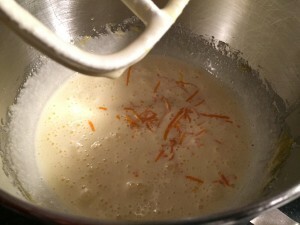 Add the milk (OR orange juice or lemon juice or liquor) 1 teaspoon at a time until spreading consistency. 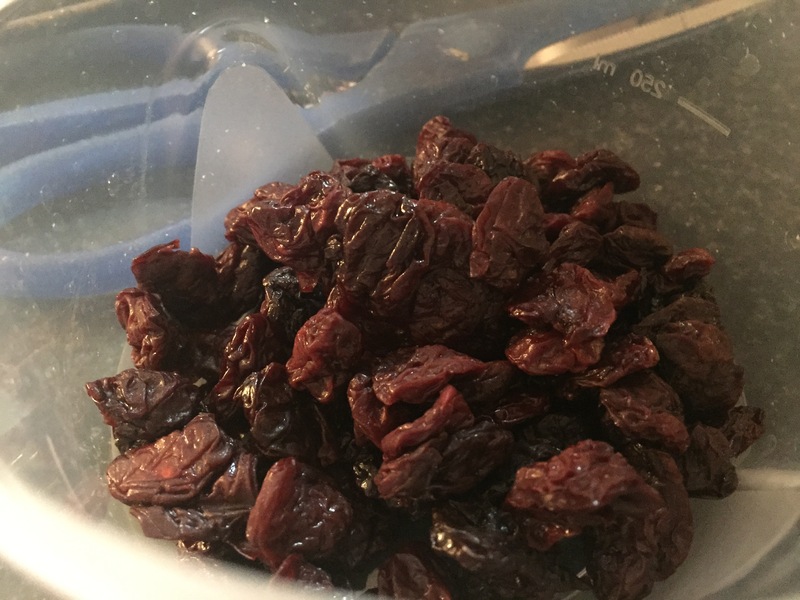 It might take less than the full tablespoon; it might take more. But to avoid the ongoing battle of more sugar, more liquid, go slowly first. 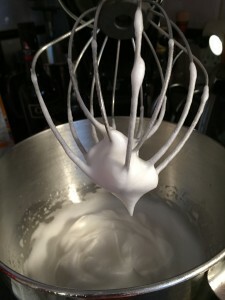 Whip the powdered sugar and butter in a stand mixer with the whisk attachment. Add one Tablespoon of milk. Beat the frosting at medium speed . The consistency should be stiff enough to pipe through a cake decorating tip, but not as stiff as you would want it for decorating a cake where you want elements to be able to stand securely on their own. It should be a bit looser than that. Add the second Tablespoon of milk if needed, and after that, add water. Divide frosting and color each part as desired. I prefer to use the cornstarch-based cake decorating colors rather than traditional food coloring because the food coloring substantially changes the taste and consistency of the icing (not in a good way). Pipe onto cookies. I use an s-shape to easily fill in the small parts of the cookies. Top with holiday sprinkles. Let dry an hour at least before storing. 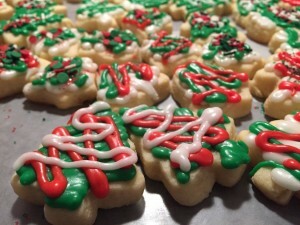 I can remember my mom making these cookies from the time I was a toddler, and indeed she was probably making them before that because the recipe came out in December 1971 when I wasn’t even 6 months old. They are one of the key cookies that make me think of childhood Christmases. 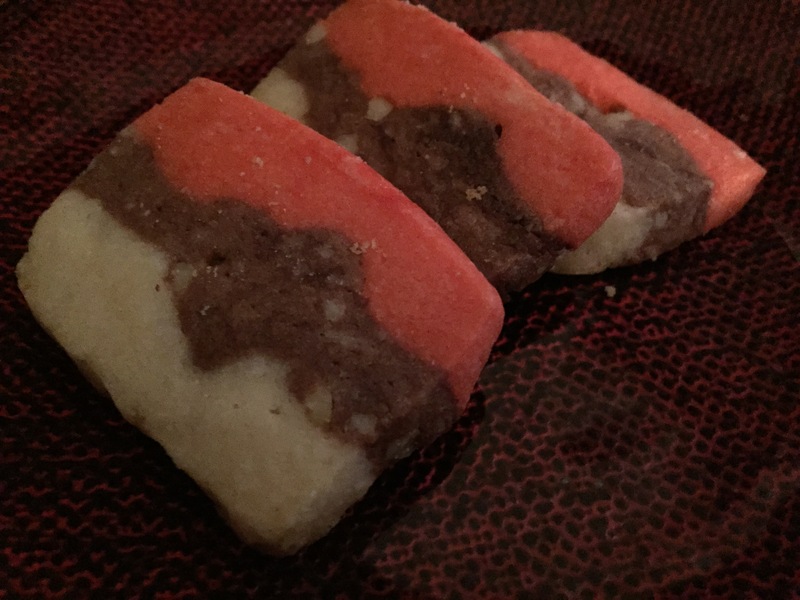 With three stripes that look like chocolate, strawberry and vanilla, these cookies evoke Neapolitan ice cream. Does anyone remember what that was? Even if you don’t, people will still be impressed by these cookies because they are cute and appear to require much more work than they actually do. This recipe has a fantastic effort yield ratio because one batch will make 6 dozen cookies. Gradually add sugar beating well. 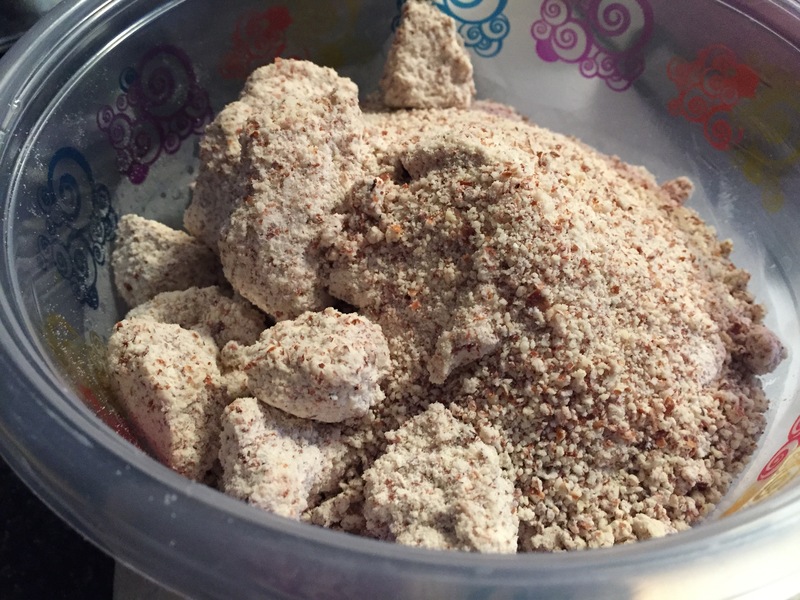 Mix flour, salt, and baking powder in separate bowl. Add into butter/sugar/egg/vanilla mixture. Mix well. In one part, stir in choclate and walnuts. Into another one of the parts, stir in a few drops of food coloring to make the dough pink. Leave the 3rd pportion of dough plain. 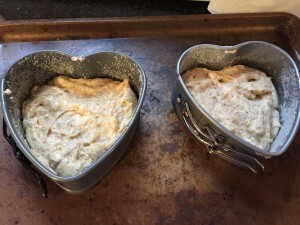 Line a 9″x5″x3″ loaf pan with waxed paper. 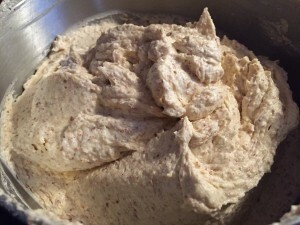 Pack plain dough into pan. 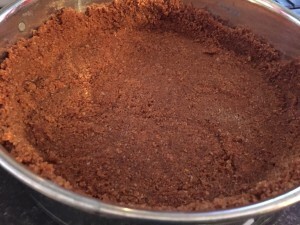 With a teaspoon, distribute chocolate part on dough and spread evenly to form second layer. Fold waxed paper over the top and press down to smooth top and press layers together. Chill at least 24 hours. – This is key to the cookies. If they aren’t fully chilled, they will spread and loose their shape. 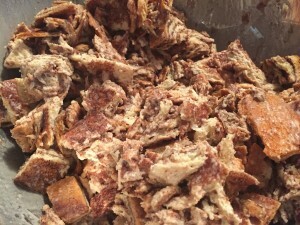 Remove dough from pan and peel off waxed paper. 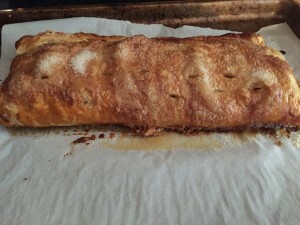 Cut dough loaf in half lengthwise, then slice about 1/4″ thick. 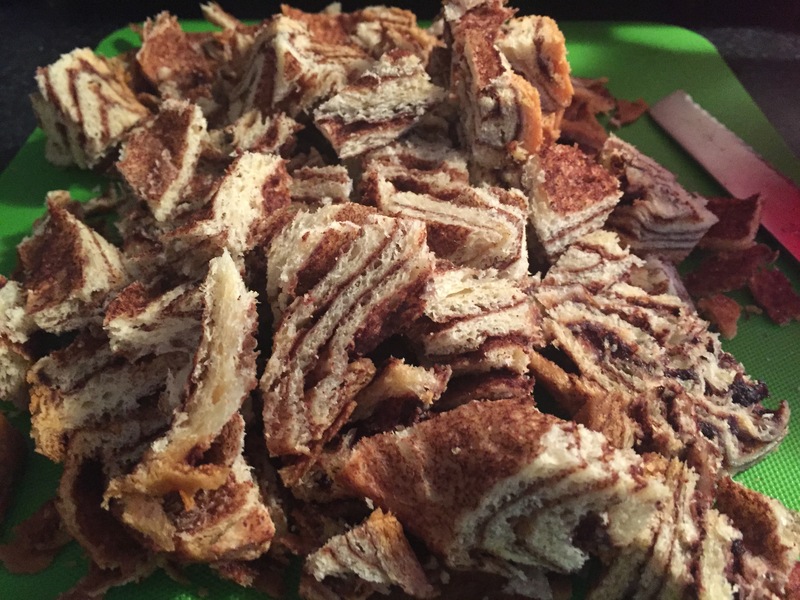 – NOTE: If your loaf pan has slightly angled sides like mine does, trim the cookie edge lengthwise to form a straight edge before cutting the slices. This will give you more uniform rectangular cookie slices. Cut the scraps into cookies and bake them. No use in wasting yummy dough. 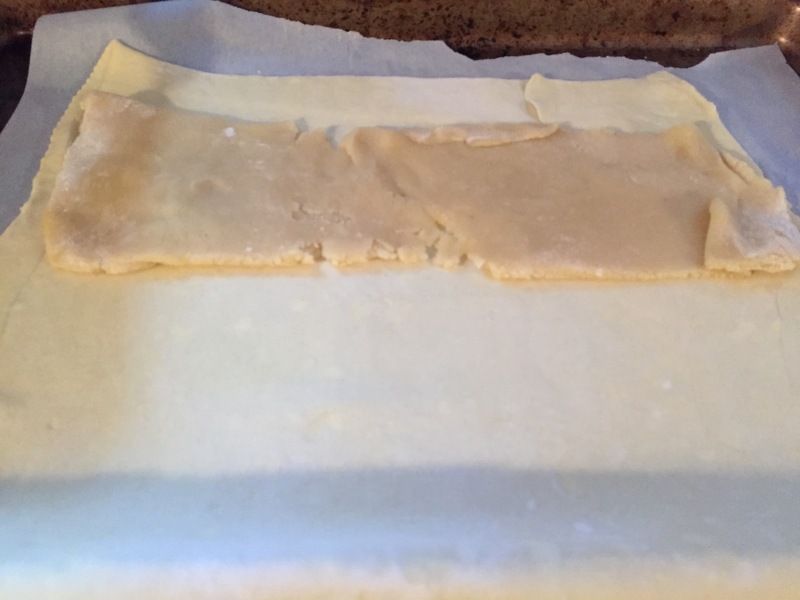 Put cookies 1″ apart on ungreased or parchment lined light-colored cookie sheet and bake about 10 minutes. Do not brown! When I saw this apple turnover with a bit of vinegar in the syrup, it was, in my mind, just the right combination of light, fruity, and acidic to balance the pumpkin pie. 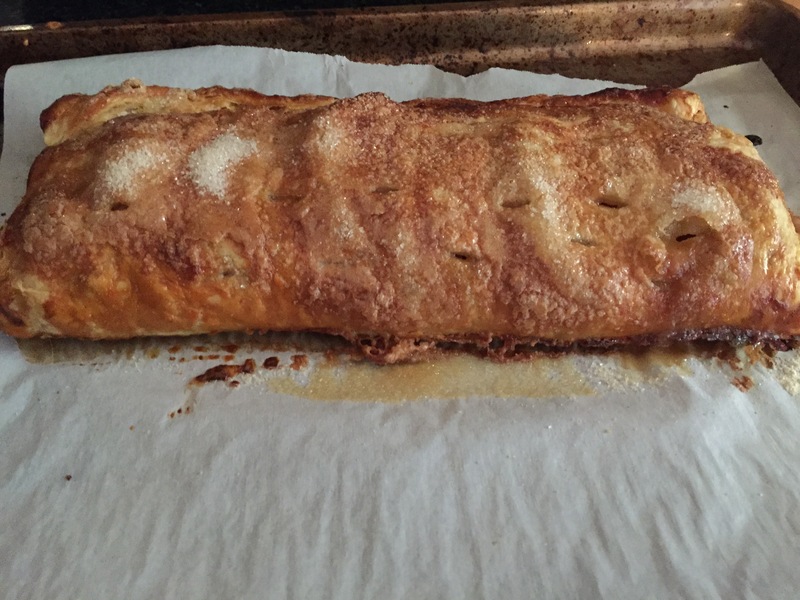 And, yes, the fact that it used frozen phyllo made it wicked easy. (Yep, that was for you, New Englanders. 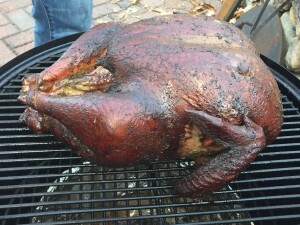 Happy Thanksgiving!) I whipped up a batch of my caramel sauce to serve with it, as well as some fresh whipped cream. It seem a bit naked without it. Perhaps I should have been suspicious of the vinegar. But, hey, it’s Bon Appetit. They know what they are doing, right?. If a recipe in their magazine, it’s been tested, right? And maybe it’s part of the current trend of slightly savory desserts Or it’s a traditional preparation, right? Yeah, I’m just not sure what was going on with this one. Maybe it’s a taste preference – other people at Thanksgiving Dinner really liked it. But I personally prefer not to have an apple tart that tastes like it’s filled with almost savory pickled apples. Or maybe there is an error in the recipe, and they meant to include less apple cider vinegar. Or maybe it was supposed to be apple cider not apple cider vinegar. This recipe calls for almond paste, which I neither had, nor had a nearby source for. Why the Italian salumeria around the corner doesn’t carry it, I just don’t know. But their lack of it compelled me to investigate how hard it was going to be to make, and it’s actually pretty easy, and tastes better than the store-bought one. 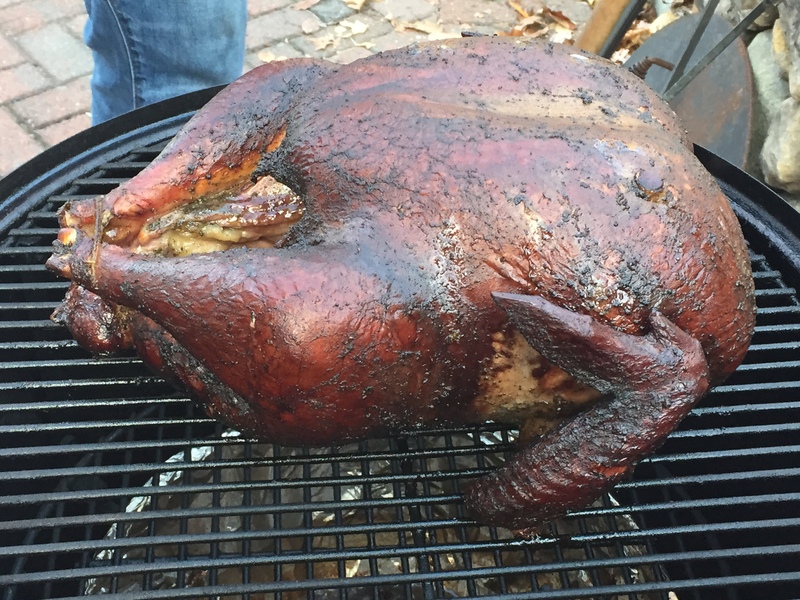 I’m posting the recipe separately though, so that this post isn’t 5 miles long. Place apples in a large baking dish and add vinegar, brown sugar, and ¾ cup water; scrape in seeds from vanilla bean and add pod. Toss to coat apples and roast, turning apples occasionally and adding a splash of water if pan looks dry at any point, until apples are tender and starting to brown and juices are syrupy, 35–40 minutes. Let apples cool in pan; discard vanilla pod. Reduce oven temperature to 375°. 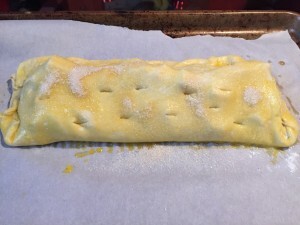 Roll out puff pastry on a lightly floured surface to a 14×11″ rectangle. 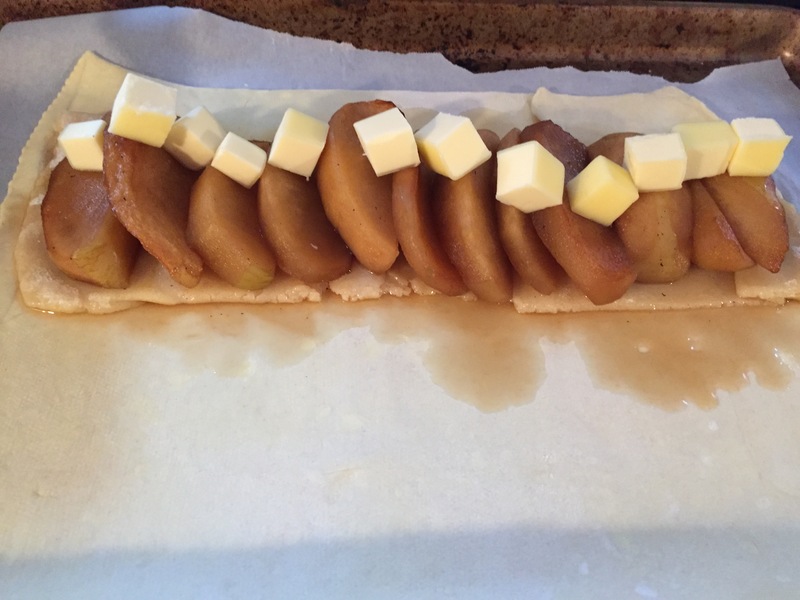 Transfer to a parchment-lined baking sheet, placing a short end nearest to you. Arrange apple halves in a single row, slightly overlapping, on top of almond paste and drizzle any pan juices over. Dot apples with butter and fold a long side of pastry up and over apples to create a long rectangle. Using a fork, crimp all open edges firmly to seal; trim crimped sides just enough to tidy edges. Whisk egg with 1 tsp. water in a small bowl and brush pastry with egg wash; sprinkle with granulated sugar. Cut several slits in top of the puff pastry to vent. Bake turnover, rotating baking sheet halfway through, until pastry is puffed and deeply browned, 40–45 minutes. Let cool slightly. Although it’s been almost 2 years since my cousins moved to Winchester, it still feels novel to have relatives close by. As I’ve written before, when I was growing up, relatives were always far, far away – an 8-hour car drive away – in Pittsburgh. It’s so wonderful to have cousins who are not only close to us geographically, but also close in age and really cool. This year we went to Thanksgiving at their house. 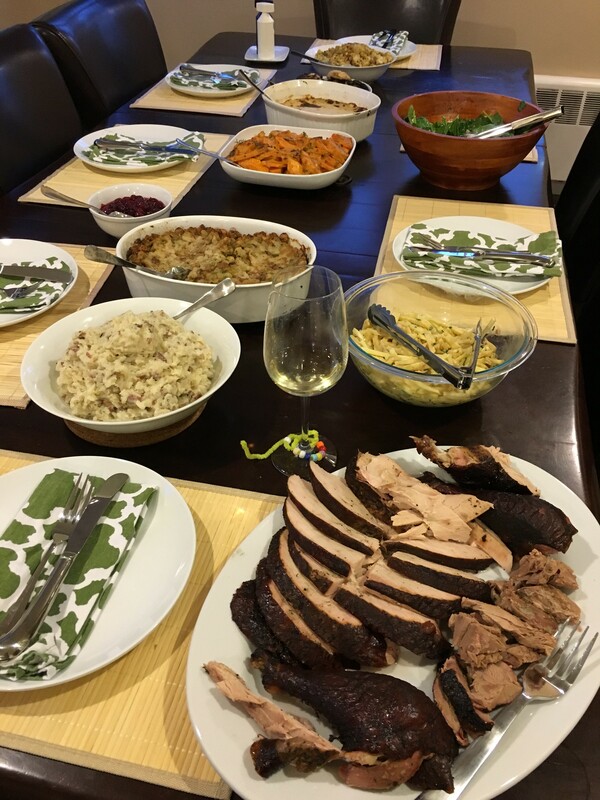 …great company from the cousins, the cousins’ 3 girls, D.’s mother, and D.’s wonderful colleague E. and her friend from home – Croatia – D.
I am genetically unable to not offer to bring something when I am invited for a meal. So when asked to bring dessert, I suggested 3 options. When my cousin L. jokingly told me she wanted to try all three, I surprised everyone by obliging. What’s better than one dessert, anyway? Well…three! Dessert 1 was a modification of a new favorite recipe of mine. Based on the lemon curd marbled cheesecake, the lemon curd is swapped for a bourbon caramel pumpkin filling. My cousin’s mom brought the pumpkin pie, and as pumpkin pie goes, it was the best I’ve ever had, I think. But, for those of you like me who don’t love pumpkin pie because of the texture and the strong vegetal taste that can never be fully surmounted regardless of the cinnamon, sugar, and whipped cream added, this Pumpkin Bourbon Caramel Cheesecake will satisfy your craving for the nostalgic pumpkin taste without the texture or vegetal issues. The texture and taste are predominantly cheesecake, and the sweetness of the bourbon caramel tempers the vegetal nature of the pumpkin, yet doesn’t overwhelm with sweetness. *For this particular cake, I decided to try some Swedish cookies that I found at the Golden Goose. 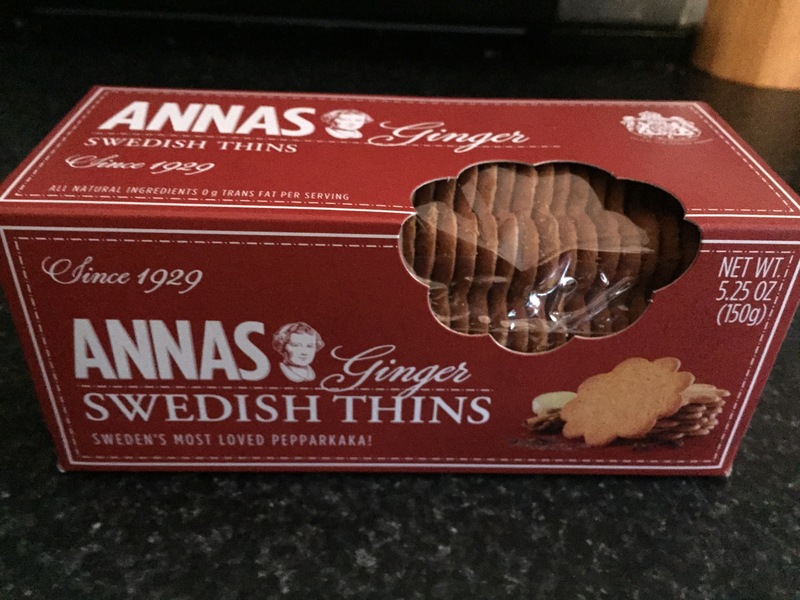 They didn’t have any gingerbread cookies that I liked, and I knew these would have a somewhat similar flavor profile. They were even better than gingerbread, I think. A bit heavier on the clove, they worked perfectly with the pumpkin. And, unlike gingerbread cookies or even graham crackers, the package was exactly the amount needed for the crust. Cook sugar in a 2 1/2- to 3-quart heavy saucepan over moderate heat, undisturbed, until it begins to melt. Continue to cook, stirring occasionally with a fork, until sugar is melted to a deep golden caramel. 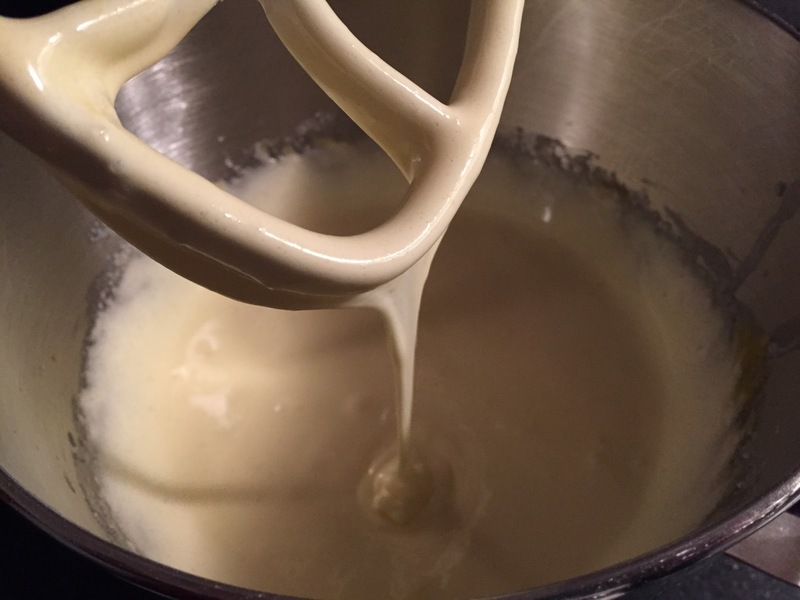 Tilt pan and carefully pour in cream (caramel will harden and steam vigorously). Remove from heat and stir in butter, vanilla, salt, and bourbon. Stir together crust ingredients in a bowl, then press onto bottom and 1 inch up side of springform pan. I use a flat bottomed glass to help press flatten it evenly. Cool crust completely in springform pan on a rack. Beat together cream cheese and sugar in a bowl with an electric mixer at medium speed until smooth, 1 to 2 minutes. Reduce speed to low and add eggs 1 at a time, beating until incorporated. Beat in yogurt and vanilla and bourbon until combined. 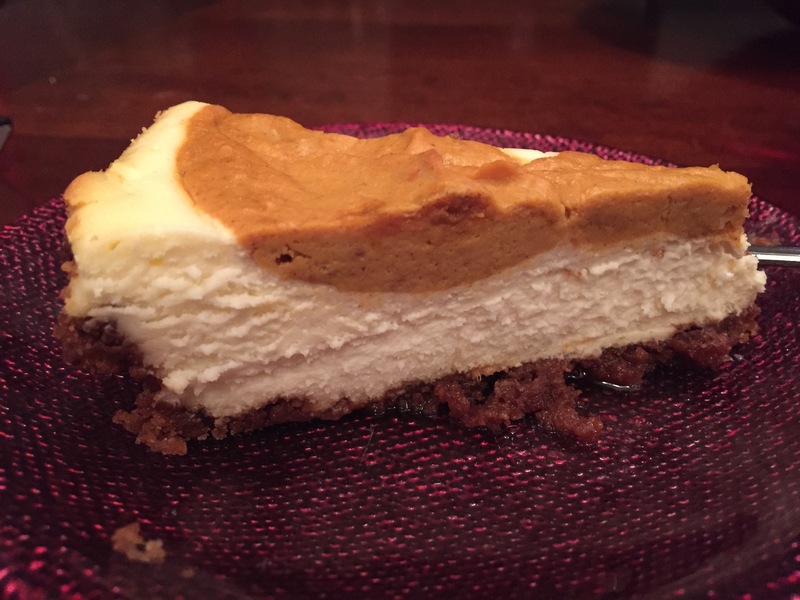 Pour two thirds of cream cheese filling into crust, then spoon half of the pumpkin bourbon caramel filling over cheesecake. Baking the Cheesecake – the baking time on this is a little tricky because it depends on your oven temp and will require some observation and judgement on your part. Set the oven at 300F. At 45 minutes, look at the cake. Ultimately you’ll know the cake is done when it is set about 1 1/2 inches from edge. The center will appear loose-ish, but set compared to what it looked like raw. The cake will continue to set as it cools. If cake is not done at 45 min, add time in 5 min increments and continue to check. 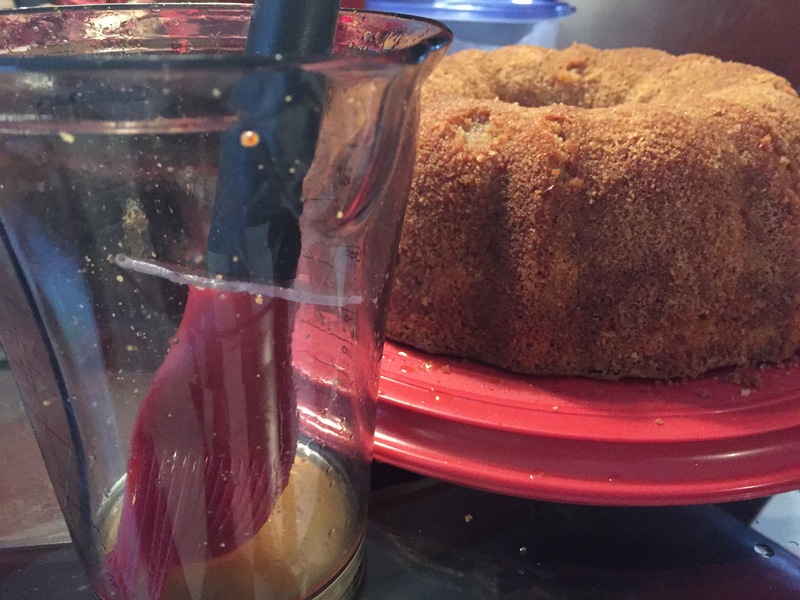 When cake is done, transfer springform pan to a rack and immediately run a knife around top edge of cake to loosen. Remove side of springform pan before serving. 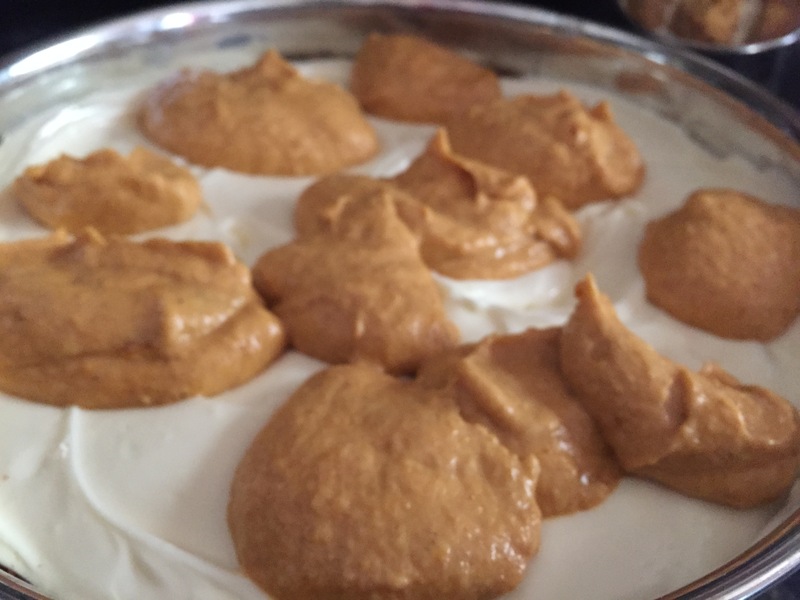 Cheesecake can be chilled, loosely covered, up to 2 days. Cheesecake must be completely chilled before covering to prevent condensation on its surface. I made this for the Great Thanksgiving Dessert Buffet Dessert #3, Apple Almond Turnover because I didn’t have any almond paste or a convenient way to get some. But I *did* have a huge bag of Trader Joe’s raw almonds in the freezer. 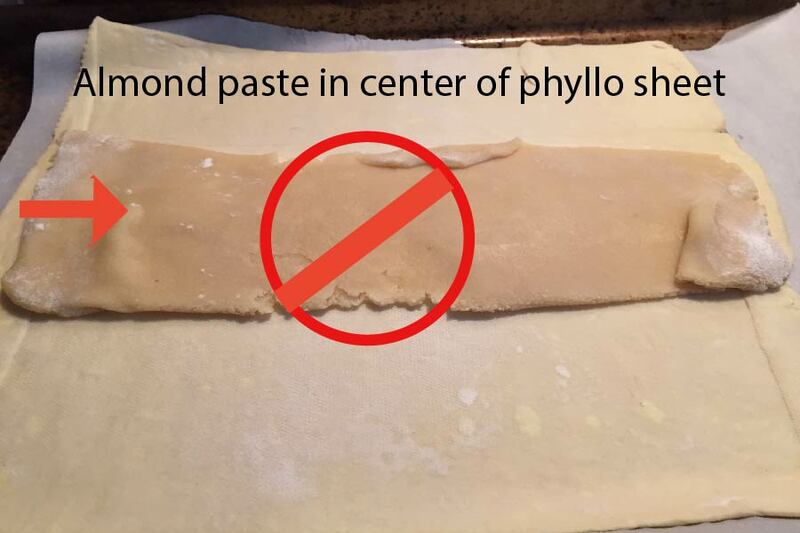 I assumed that almond paste would be really hard to make, but once I investigated it, I learned that it would actually be faster to make it at home than to get in the car, battle the Boston traffic, and fight for a parking space both to the store and back. Now that I’ve made it, I’m not sure I’d ever buy it again, particularly since I always keep raw almonds on hand. It is exponentially better than the store bought ones that I’ve bought. Maybe in Europe the store-bought ones are better, but here…homemade it is. 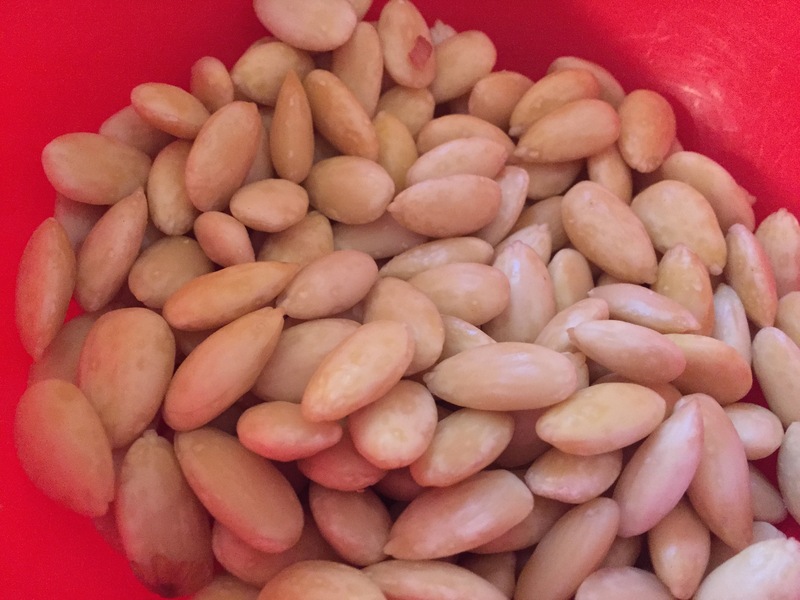 The part part that concerned me most about the recipe was blanching the almonds, more specifically peeling the blanched almonds. I pictured having to tediously peel each almond much like a too-fresh hard-boiled egg (ref. Grams’s Deviled Eggs). But they are actually incredibly easy – squeeze the end and they pop right out! The only thing you have to be careful of is that they go flying when you pop them out (kind of like the snails Julia Roberts tries to eat in Pretty Woman). 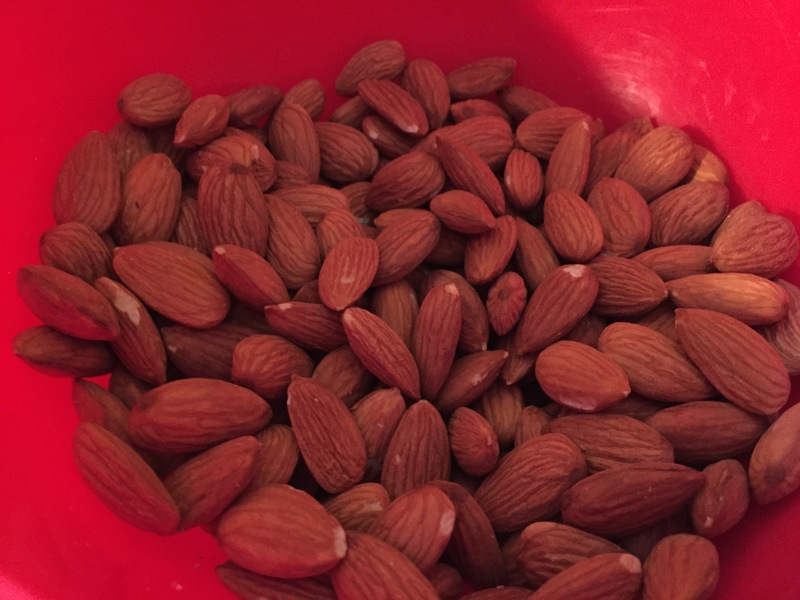 Put 1.5 cups + 1.5 Tblsp raw almonds…. 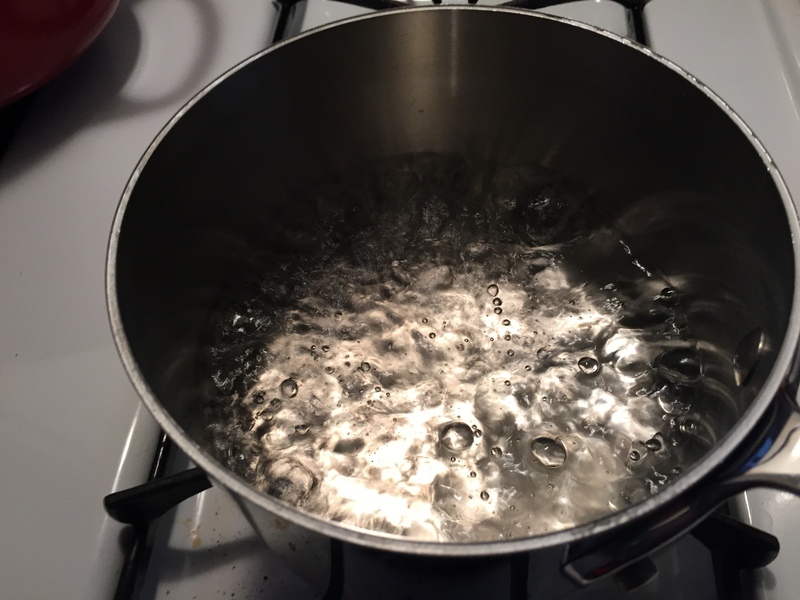 into a pot of boiling water. for exactly one minute, but no more because they will get too soft. Drain them in a colander and rinse in cold water to cool them. 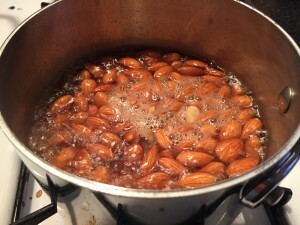 Dry the almonds.then gently squeeze the skin to loosen them. 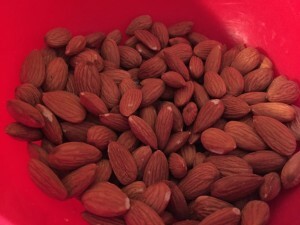 The almonds will pop right out, and rather aggressively, so keep your hand around them so you can catch them. But they will come out with just a minimal amount of effort. 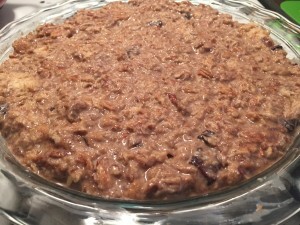 Up to 1/3 cup (about 50 grams) Kirsch or simple syrup, optional – Actually I don’t consider this optional. The liquor flavor imparts a MUCH better background note to the almond past than almond extract, which is what most recipes call for. I didn’t even have kirsch, so I used white rum, and it was perfect. I think the almond extract makes it taste fake. The liquor enhances the natural flavor of the almonds. Add the sugar, honey and water to a medium saucepan set over medium-high and bring to a boil, stirring often. 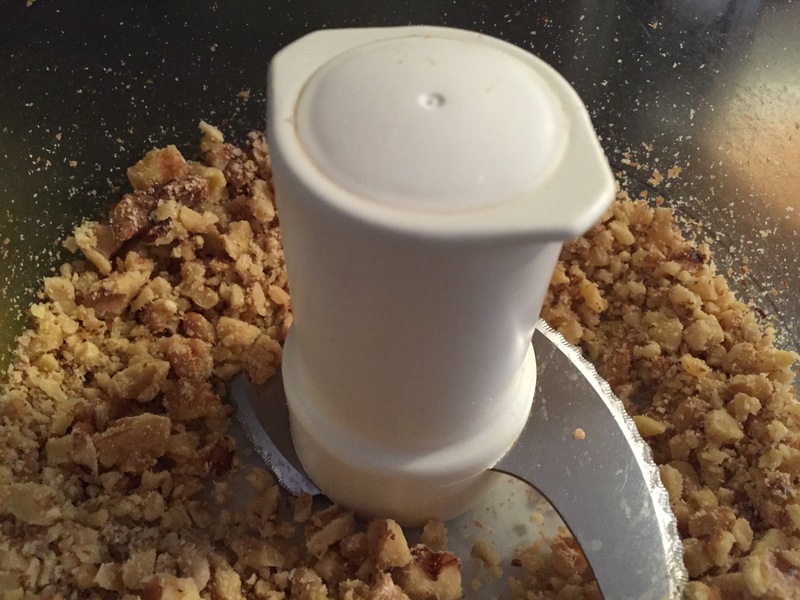 Grind the almonds in a large food processor until coarsely chopped. Pour the boiling water over the almonds and continue blending until smooth up to 10 minutes, scraping down the sides of the bowl if needed. It will be hard to get the same consistency as store bought almond paste and that’s ok. If the mixture is so thick that the food processor is straining, you can add a little more hot water, kirsch or simple syrup. 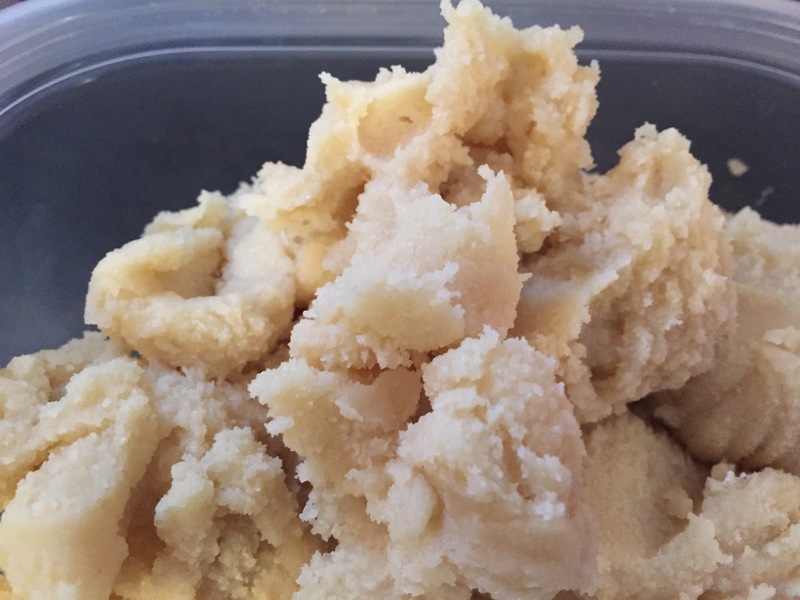 Wrap the almond paste in plastic wrap or drop it into a tupperware container and allow it to cool or store in refrigerator 2 – 3 weeks or freeze up to 3 months. 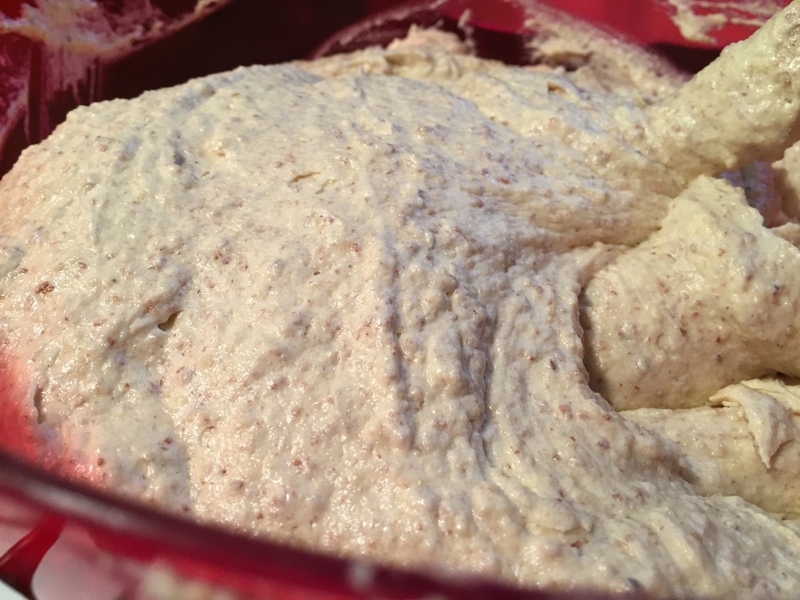 When you are ready to use the almond paste knead in the butter – it will make it smooth and not so sticky. I skipped this step since I was going to use it right away. This dessert was featured on the November cover of Bon Appetit Magazine, and it caught my attention because it was pretty and different. 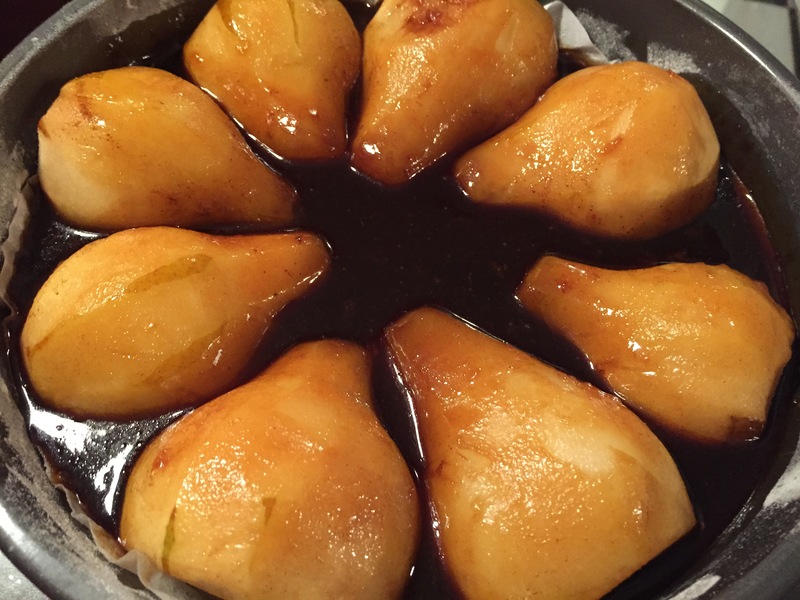 Other than poached pears, I don’t think I’ve ever made a pear-based dessert. Come to think of it, pears are kind of the forgotten fruit of American baking. 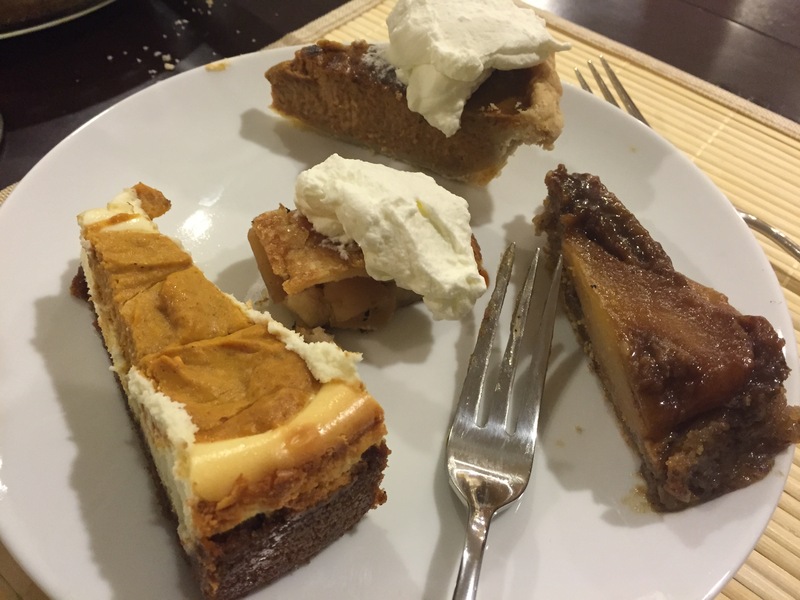 It seems like it’s all about the apples – apple pie, apple crisp, apple cake. 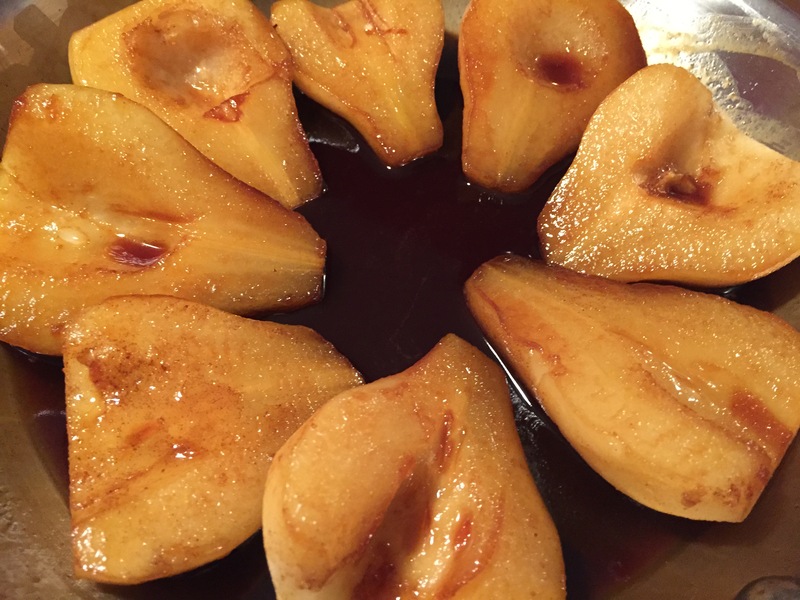 Poached pears, which feels a lot more French. And fancy. 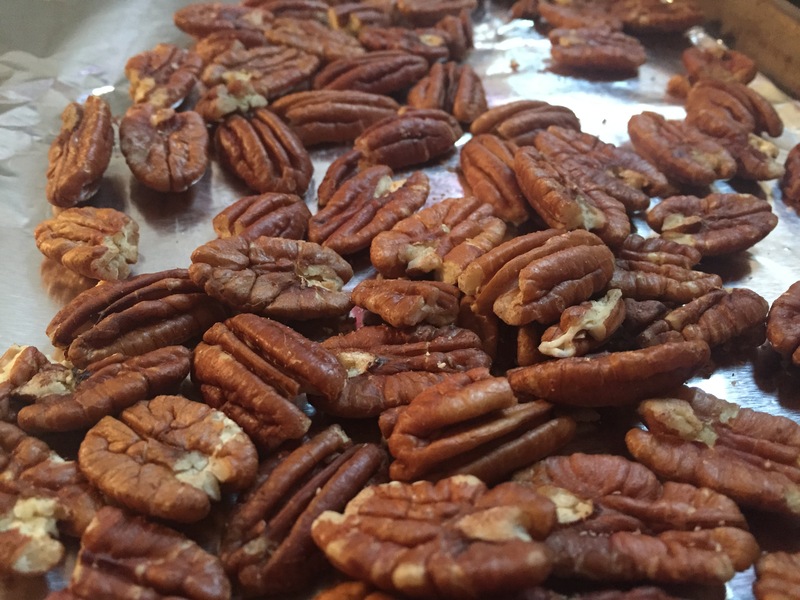 (Though they are super easy, and so delicious). But interestingly, you can actually substitute pears in place of apples in many of our typical apple desserts as long as you consider the slight differences in texture, moisture and sweetness depending on the variety. Pear-dessert philosophy aside, this recipe isn’t about an apple substitution or even an American style dessert. It actually feels more European, even a bit Middle Eastern, like something you might find in a French restaurant in Tel Aviv. Not that I’ve been, but it’s what I imagine. And isn’t food somewhat about using your imagination? Butter a 10″-diameter cake pan and line bottom with a parchment paper round; flour sides of pan. Cook orange juice, ¼ cup pomegranate molasses, ¼ cup sugar, and remaining 2 Tbsp. 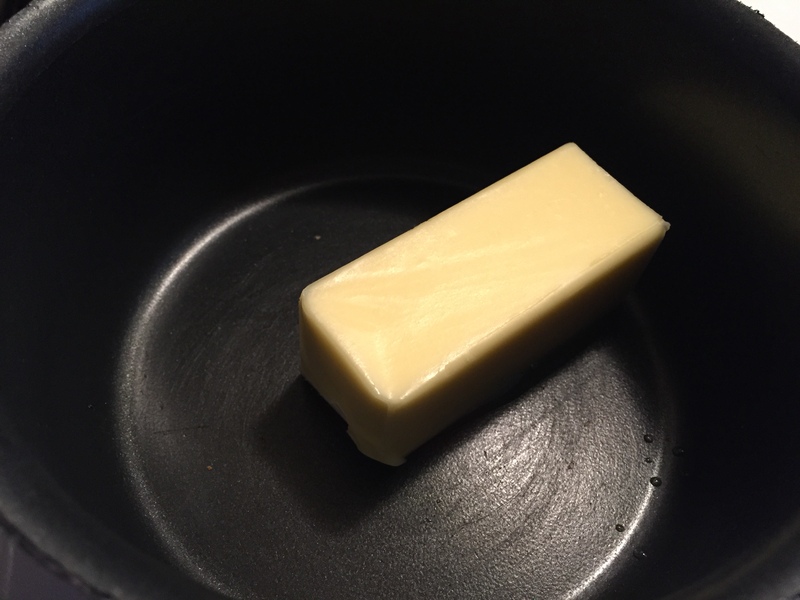 butter in a medium skillet over medium heat, stirring, until sugar is dissolved and mixture is slightly reduced, about 4 minutes. 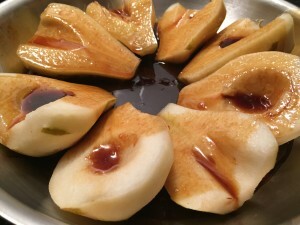 (As you will note from the upcoming pictures, I started the syrup in a separate pot, then poured it over the pears that I placed in the skillet. This is what happens when you don’t read the recipe thoroughly. But it did not seem to make a difference. Pour the syrup over them if you started it in a separate pot like I did. and cook (undisturbed) until they begin to release their juices, about 3 minutes. Turn pears over and cook just until slightly softened, about 3 minutes. 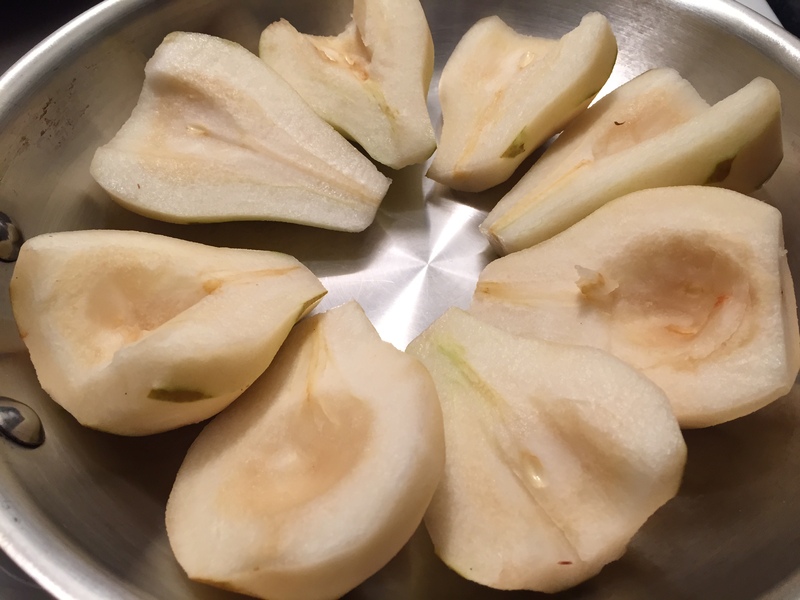 Let cool slightly, then arrange pears, cut side down, in prepared pan. Return skillet to medium heat and cook liquid in skillet until thickened and syrupy, about 5 minutes, depending on juiciness of pears. Pour syrup over pears and freeze while you prepare the batter (this is to allow syrup to set up—don’t let it freeze solid). Pulse walnuts and remaining 1½ cups flour in food processor until walnuts are finely ground. Pulse in baking powder, baking soda, salt, and cardamom. Using an electric mixer on medium speed, beat eggs, orange zest, and remaining 1½ cups sugar in a medium bowl until pale and fluffy, about 5 minutes. then gradually mix in oil. Pour batter over pears and smooth top. 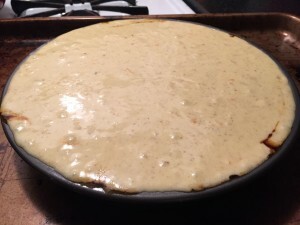 Set pan on a foil-lined rimmed baking sheet and bake cake until top is golden brown and a tester inserted in the center comes out clean, 50–60 minutes. Transfer to a wire rack and let cool in pan, 15–20 minutes. Run knife around edges of cake to loosen and invert onto rack. Remove parchment and let cake cool completely. Drizzle cake with more pomegranate molasses just before serving. Do Ahead: Cake can be baked 1 day ahead. Store tightly covered at room temperature. This is my go-to dessert staple. My signature recipe, if you will. One of my favorite things to make, and if you ask the people who eat the desserts I bake, one of their favorites, too. They’ve told me I should bottle and sell it. Caramel is a favorite of mine, which is probably why I enjoy making it so much. 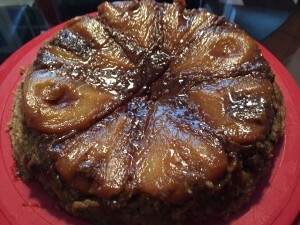 And this recipe may be my most favorite caramel taste. 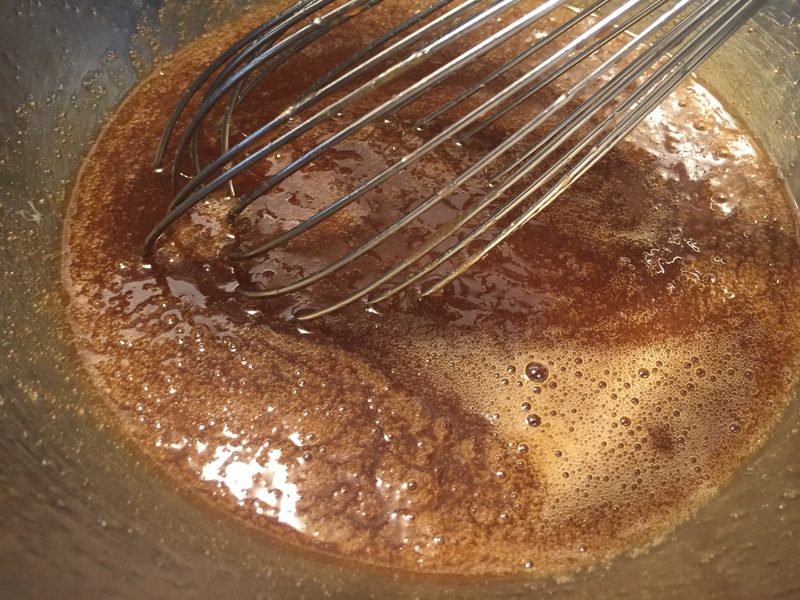 It is the perfect balance of sweet and salty, but the flavor also adaptable – you can up the salt and easily convert it to salted caramel sauce. Or you can add a liquor to make it a bourbon caramel sauce or orange caramel sauce. It’s also versatile. Being the perfect sauce consistency, you can put it on almost any dessert. 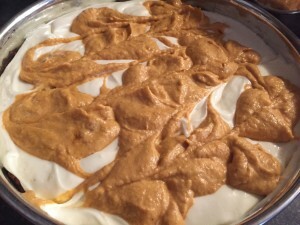 Or you can swirl it into a homemade ice cream or drizzle it on top. 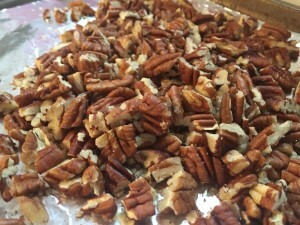 Or you can use it in a cookie, wuch as the Caramel Pecan Christmas Cookies, which is the recipe from which I adapted the sauce. Or you can just eat it out of a bowl by itself. Ok, maybe that is a bit much. But it’s really that good. The keys to the sauce are patience and attention. Caramel goes from caramelly to acrid in about 3.2 seconds. Optional: 1 – 2 Tblsp good bourbon or other liquor. I am not a fan of bread pudding. I find it soggy and texturally boring. This will probably cause you to question why I’m trying to bake it. I’m trying to bake it because there is one exception to my dislike of bread pudding, and that is the butterscotch bread pudding at Eastern Standard. Moist, but not soggy with an almost crunchy crust and veins of intense butterscotch flavor winding their way through it, it’s everything I imagine bread pudding should be but rarely is. I have never tried to replicate it, because it’s hard to replicate a recipe for something you aren’t well-versed in making. Replication requires duplication and modification of technique. I don’t know bread pudding technique well enough to even begin to figure out how to tweak it to make it taste like the one at ES. And since I dislike the majority of bread pudding, I wasn’t keen on the idea of eating the leftovers or wasting the ingredients. 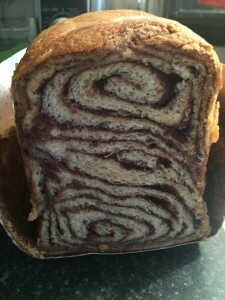 That is, until I was stuck with a stale $7 loaf of cinnamon babka. It looked so promising when I bought it at the Golden Goose – brioche-style bread, tightly rolled around layers and layers of cinnamon. But it was stale. Or just dry. 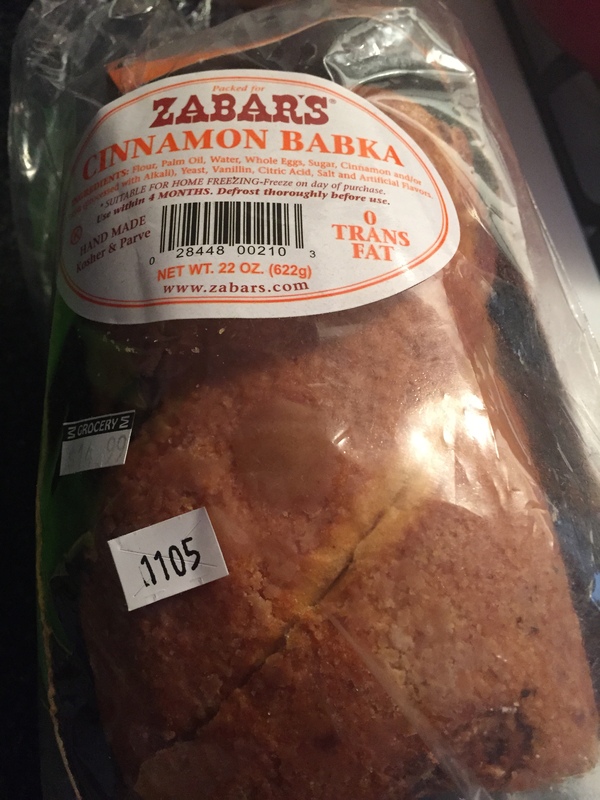 And the cinnamon had a harsh, unpleasant spicy note. Since it’s destination was my garbage can anyway, I figured the bread pudding was worth a shot. After scouring the internet and reading multiple recipes, I cobbled together the following recipe. It’s somewhat loosely adapted from the Back in the Day Bakery Cookbook. But it’s a lot smaller than theirs and also pulls in elements from a variety of other recipes. 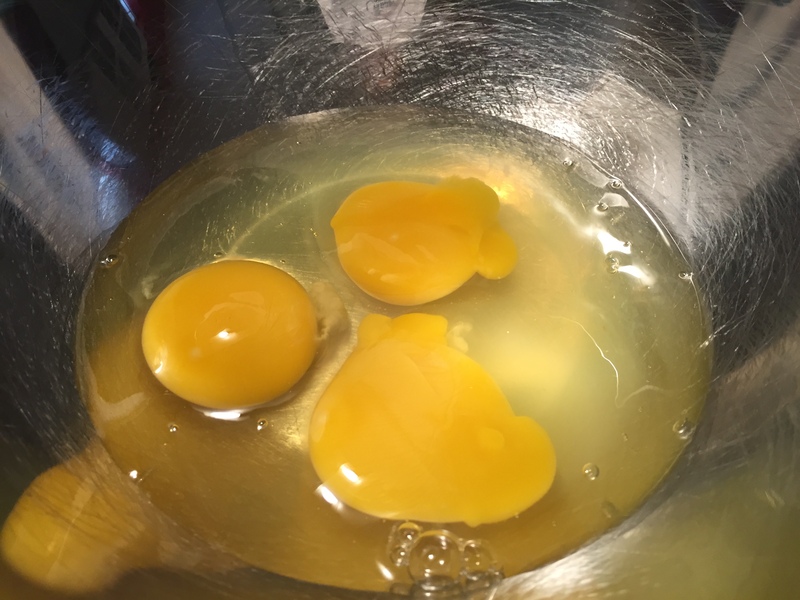 Beat together eggs, half and half, vanilla, and salt. Add them to the bread/milk/egg mixture. Normally you want to let this mixture soak together for 15 – 30 minutes, but this bread collapsed and lost its shape so fast that I didn’t wait. Put the mixture into a well buttered, deep pan. 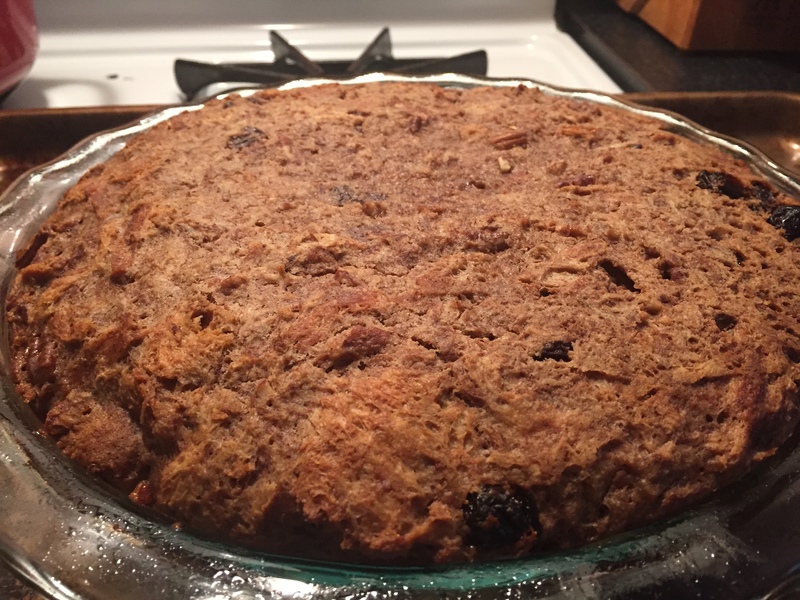 I used a glass 10″ pie dish. Put the dish onto a cookie tray and cover it with foil. 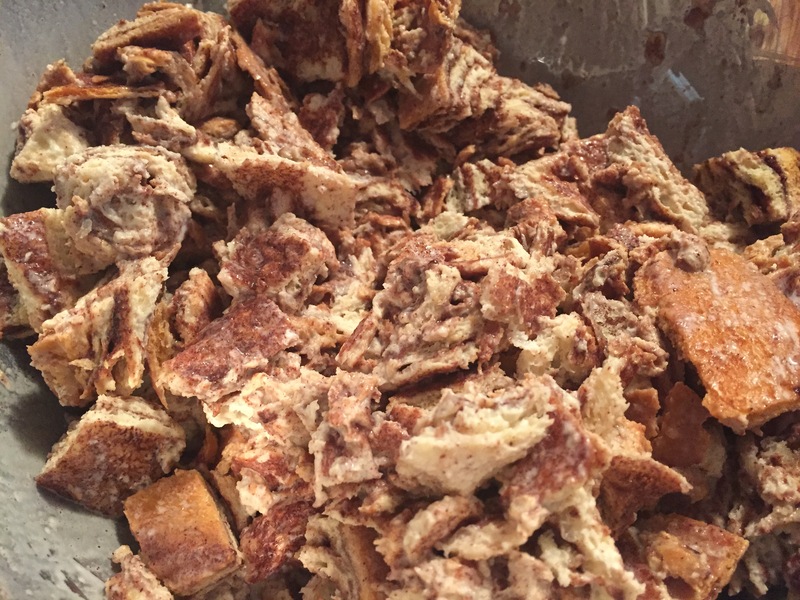 Bake at 350 F for 55 minutes with the foil on, then remove foil and bake for another 10 – 15 minutes without the foil. While it bakes, make the caramel sauce. Remove from oven and cool on rack for at least 15 minutes before cutting so that the custard has time to set. Serve with a drizzle (or 6) of caramel sauce. Unfortunately it didn’t taste like the one at ES at all. It was still very custardy. The taste was quite nice, but the texture was still too uniform and soft for me. A surprised us early last week by coming to Boston for the week, including Labor Day Weekend. We were literally sitting down to lunch on Monday at Sam’s – to commemorate their last day in the current building (SNIFF! SNIFF!) when she came walking in. Since we is here, we had to have a deck dinner (or several) ! So we had a small Labor Day Deck Dinner Party on M & C’s deck. M & C like themed cuisine and thus picked Greek as the theme. What Greek cuisine has to do with Summer or Labor Day is unclear 1. It’s just a favorite destination of theirs and delicious food. 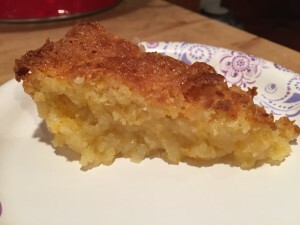 As usual, I had dessert duty and initially considered making portokalopita (Greek Orange Pie) but I’ve made it a couple of times and I was in the mood to try something new. Lacking any Greek cookbooks, I consulted Google and found this fantastic site called My Greek Dish – a panoply of recipes for sweet and savory Greek food with enticing photography and helpful organization and recommendations. 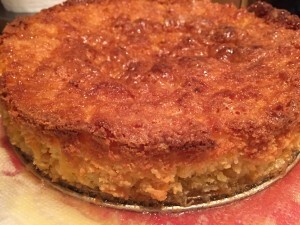 In the category “extra sticky desserts”, which is where they also classify portokalopita, I found Ravani – coconut cake with syrup – a simply but tasty-sounding coconut and citrus cake. 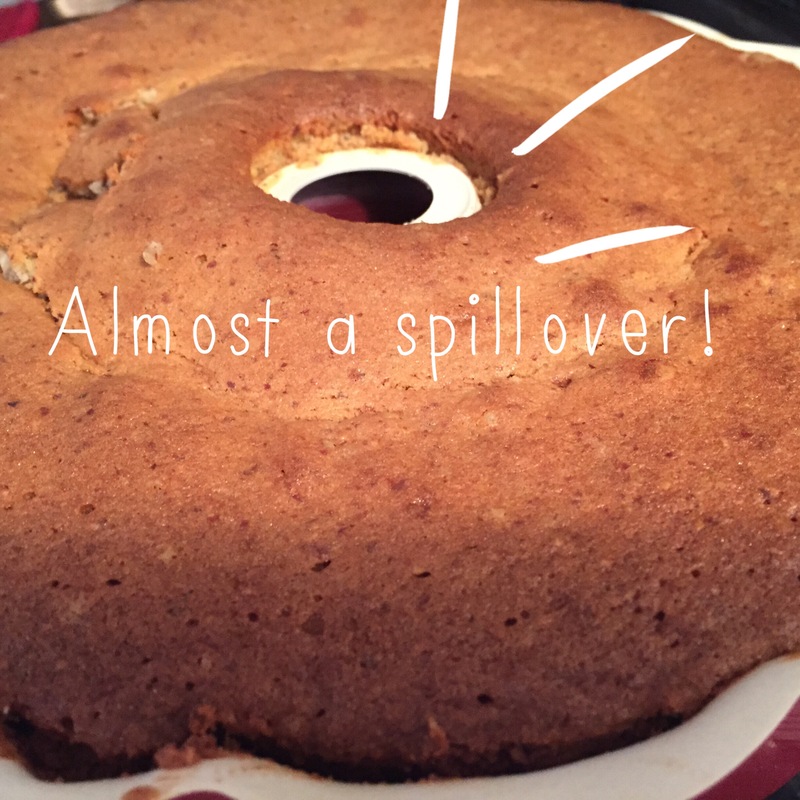 According to the website, there are some key tricks to this cake, and I figured out one along the way. 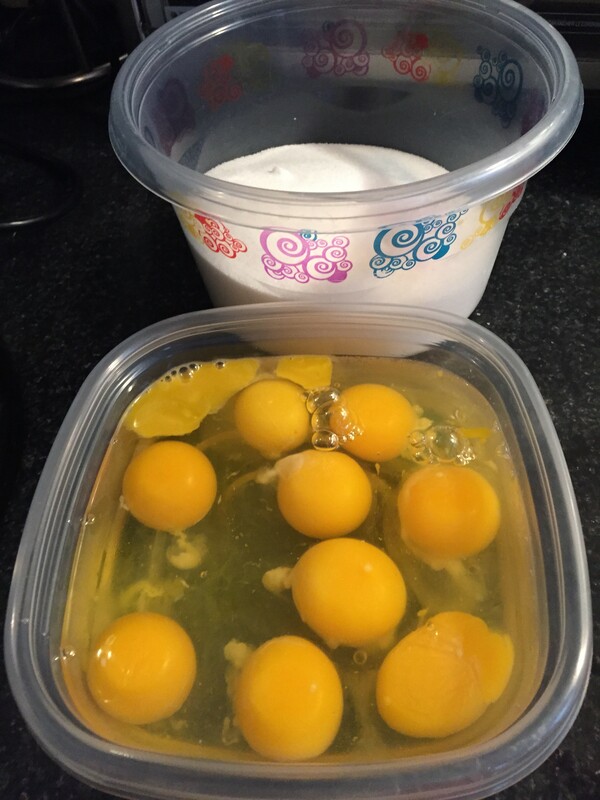 Separating the egg yolks and whites to add to the cake separately. 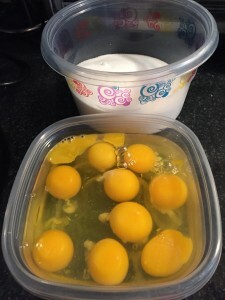 The yolks go in after the butter and sugar have been creamed, and the whites get beaten into a meringue, then folded into the batter at the end. This supposedly makes a fluffier, less “egg-y” cake. (Mine) I didn’t have the right sized pan. The closest thing I had was a springform that was 2 inches shorter than the requirement. It worked, but it leaked as it was baking and cooling. 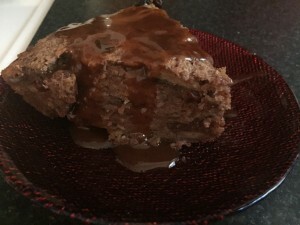 The cake was incredibly moist despite this, but I’m curious if it would have been more moist if I’d used the right type of pan and not lost whatever leaked. It was almost like melted sugar and egg white. (Also mine) I used Baker’s unsweetened coconut – the one in the blue bag. I wonder if it much moister than whatever the original recipe used. Not that it’s that moist, but maybe enough? Next time I make it, I might try to squeeze out some of the moisture by putting it into a paper towel and wringing it out. When adding syrup to the ravani cake, always make sure that the cake is cold and the syrup is really hot. Ladle really slowly the hot syrup over the cold ravani, enabling each ladle to be absorbed, so that the syrup is absorbed evenly. Even though it will be really hard…you should wait for the ravani to cool before cutting into pieces, or else it will crumble. Ideally serve this Greek coconut cake cold from the fridge the following day. Put a second, very clean, mixing bowl and whisk in the freezer to chill. Butter and flour a round cake tin, approximately 30cm in diameter. 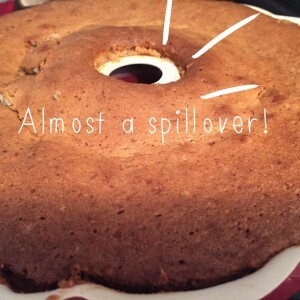 Use a cooking brush to butter the bottom and sides of the cake tin. Sprinkle with 2 tbsp of flour and shake the cake tin, so that the flour covers the butter. 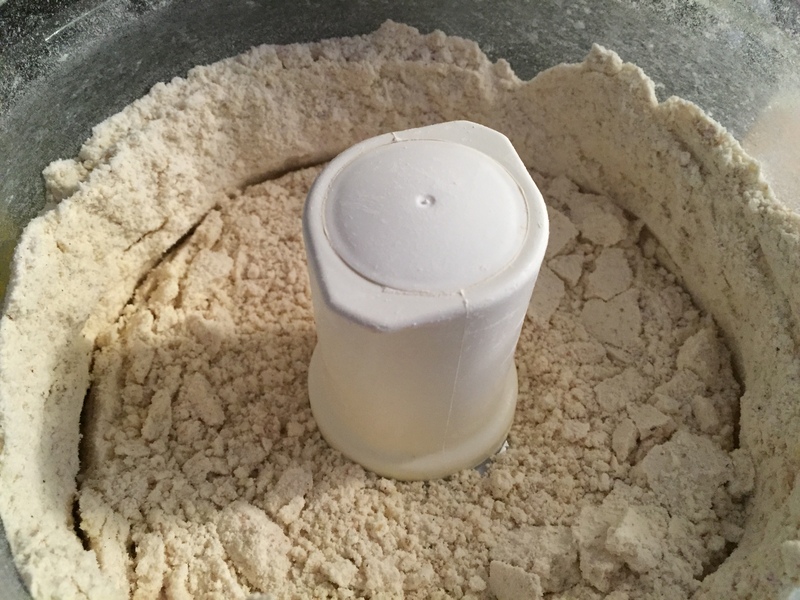 Tap to get rid of any excess flour. This technique will prevent the ravani from sticking on the pan. 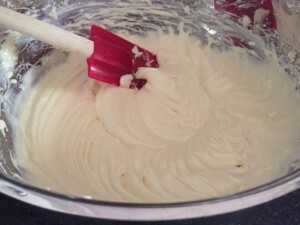 In a stand mixer, cream the butter and sugar on medium speed until light and fluffy – about 5 – 7 minutes. Add the egg yolks, one at a time, allowing each one to be incorporated. Set the mixture aside. 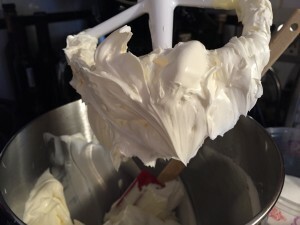 Place the egg whites and a pinch of sugar in the cold clean mixing bowl. Beat the egg whites until the mixture is very thick and glossy, and a long trailing peak forms when the whisk is lifted. 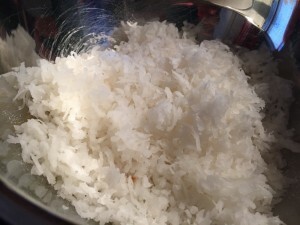 In another bowl, blend the flaked coconut, the flour and baking powder. 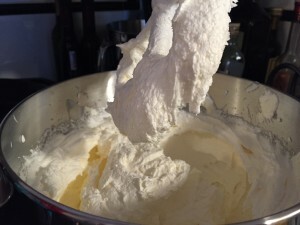 With a spatula add the meringues and half of the flour mixture into the whisked butter and blend lightly, until the ingredients are combined. 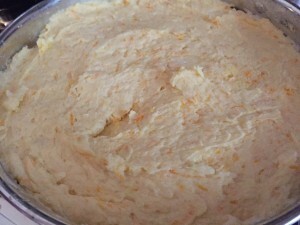 Add the rest of the flour mixture and the orange zest; folding very lightly. Pour the ravani batter into the pan and smooth out the top. Bake the ravani in preheated oven at 40-45 minutes, until golden and cooked through. After baking the cake, let it cool down for a while. While the cake is cooling, make the syrup. To achieve the right texture for the syrup of the ravani cake, you should never stir the syrup while it is boiling. Just bring to the boil, let the sugar dissolve in the hot water and boil for 5-10 minutes, until the syrup thickens a little bit. Add in a saucepan the sugar, the water and lemon juice; boil for about 5-10 minutes, until the sugar has dissolved and the syrup has slightly thickened. Remove the pan from the stove and ladle slowly the syrup over the ravani cake, allowing each ladle of syrup to be absorbed, before ladling again. Allow time for the syrup to be absorbed and place in the fridge. I could only get the cake to take about half of the syrup. I never put it in the fridge like I was supposed to which may be the reason. Nonetheless, it was the hit of the party, and I’ve already been told that I have to make it again because not everyone got a piece. The cake is incredibly moist, coconut-ty and citrusy. Despite the large amount of sugar in the recipe and the sugar in the syrup, it’s not cloyingly sweet. It’s complex, light with the citrus zing, and might even be able to be made gluten free because there is so little flour in it. It’s also easy to make, just a bit time-consuming. This is definitely one to add to your repertoire. 1 Nothing. But I suppose you could say that the weather is rather summer-y in Greece and, unfortunately, not a lot of people are working. I don’t think there is one Bostonian ready for summer to be over. The consistent refrain here is that it’s gone by too fast, as though there had barely been a summer at all. After a cool June, just two months of warm- but not crazy hot -weather has hardly been enough to balance the 10 feet of snow we had this past winter. While it was packed into just 6 weeks or so, it made the winter seem interminable. 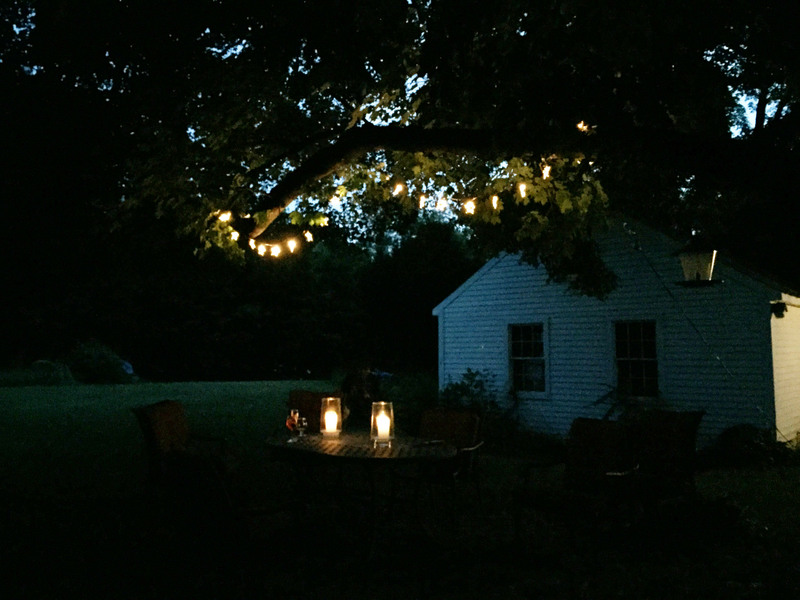 We went to S and T’s house – C’s sister and brother-in-law’- in Amesbury for a cookout to celebrate the second to last weekend of informal summer. (Yes, technically summer is not over until September 22 or whatever, but to me, Labor Day heralds the close of summer and start of Autumn.) Their house is a pastoral respite from the city – a homey white 100-year-old farmhouse that borders on on a verdant rolling field of a back yard ringed by majestic shade trees,a miniature farm with 2 dogs, 2 cats, and a bunch of chickens, and barbecue implements we city dwellers miss, including a charcoal grill, and a smoker. Slowly add a hoppy beer, stirring until all of the cheese is soaked. Let sit for a least a half hour, and the beer and cheese will soften into a saucy spread-like consistency that is perfect spooned onto char-grilled burgers and topped with crispy bacon. 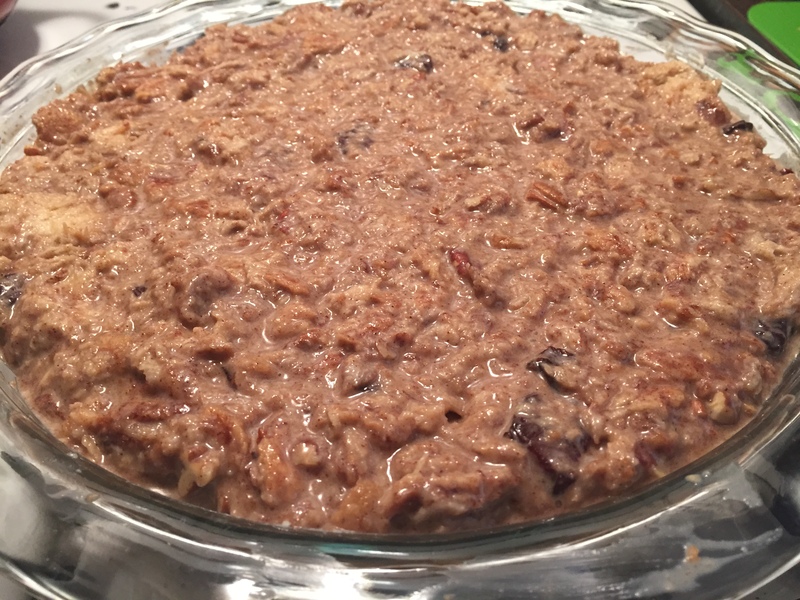 I wanted to make a French-inspired dessert – perhaps because I was going to S who grew up with them; perhaps because of the French class I took this summer. I pulled out the Bouchon Bakery Cookbook that has been sitting under my coffee table. unused, for almost 2 years. The reason it is unused is that the recipes are either too complicated or require ingredients that aren’t that easy to get. 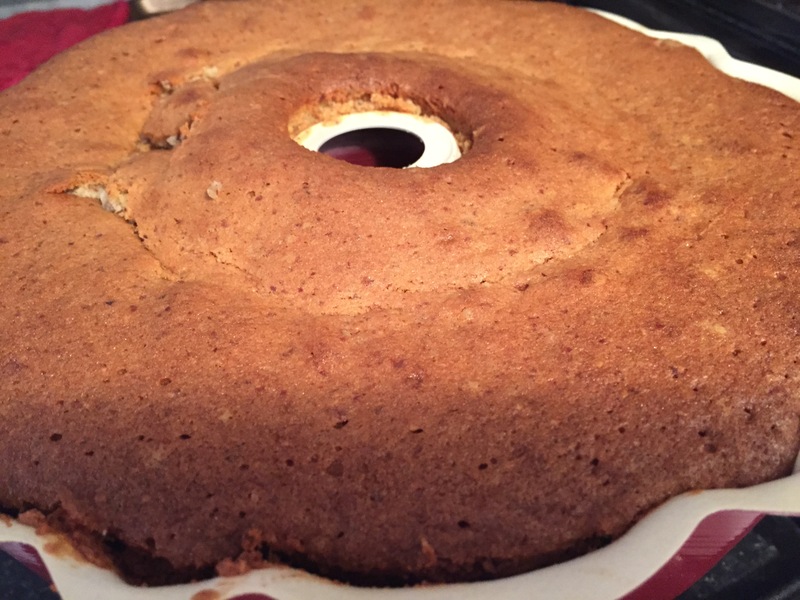 But I found a surprisingly easy recipe for rum cake. 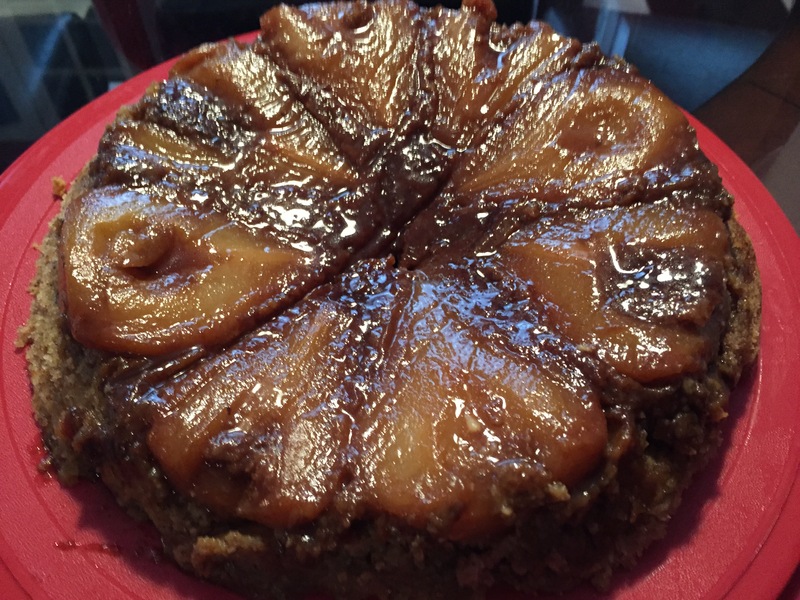 I was almost put off by their comparison to a Tortuga cake – one of those awful toursity rum cakes in the yellow box that everyone seems to bring back from the islands. 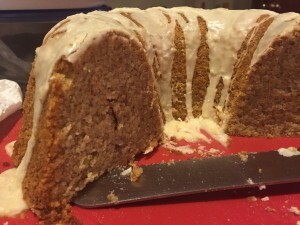 But the recipe sounded really good, and it is a boozy cake, so I had to give it a try. IMPORTANT: This recipe is made for a 15-cup (10½-inch) Bundt pan – the old-fashioned Bundt pans or the ones marked “anniversary”. I only had a 12-cup pan, so I made two extra ‘side cakes’ with the leftover batter. The original recipe says that you only need to leave a 1⁄2-inch space at the top of the pan when filling it with batter, and bake the cake for slightly less time. 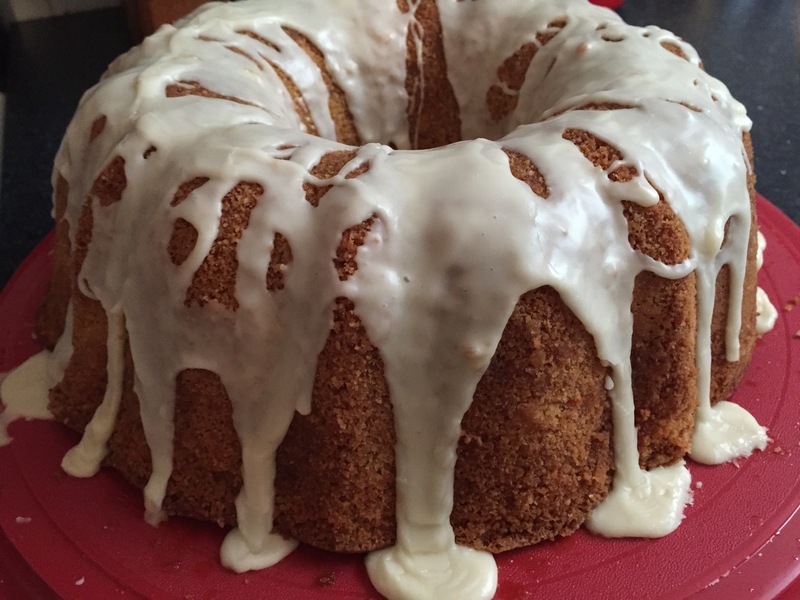 You need to leave more like an inch of room, as my Bundt was verging on a “Cindy Bakes A Cake” overflow. I put the extra into two small heart-shaped pans and baked for about 40 minutes. Preheat the oven to 325°F (convection) or 350°F (standard). 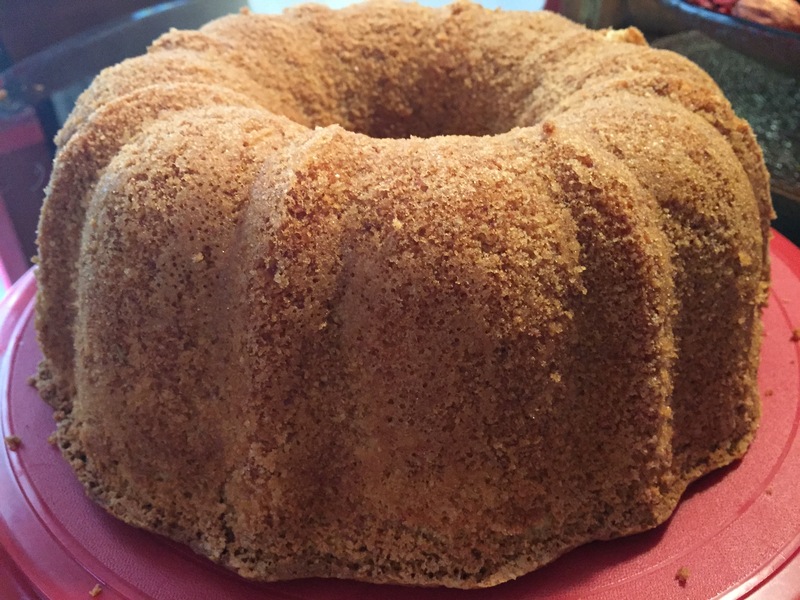 Brush the Bundt pan with butter. Refrigerate or freeze the pan to harden the butter (this will make it much easier to coat the pan with an even layer of sugar). Add a large spoonful of sugar to the pan and rotate and tap the pan to cover the surface evenly. Invert the pan and tap lightly to remove any excess sugar. 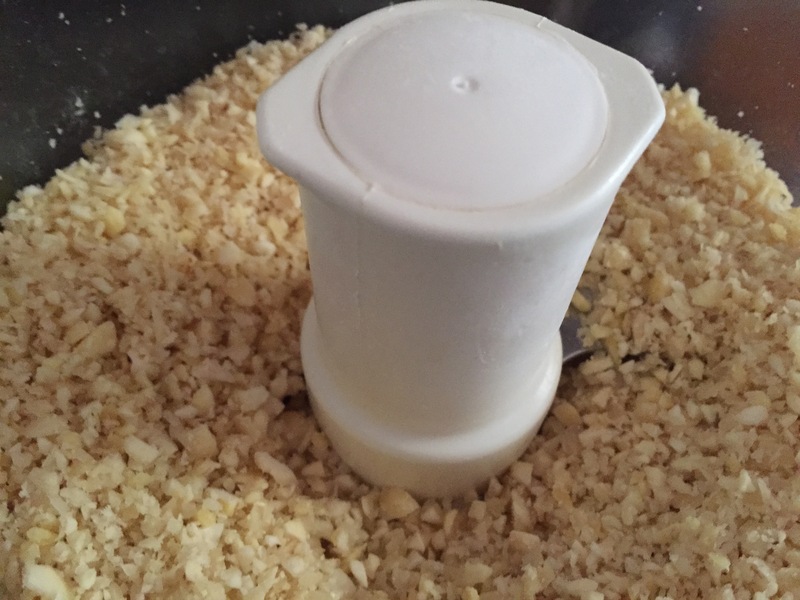 Place the almond flour in the bowl of a food processor and pulse about 10 times to break up any larger clumps. Pour the almond flour into a large bowl and run it through your fingers to be certain that there are no remaining lumps. 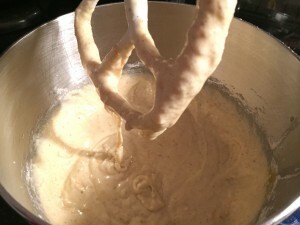 Add the all-purpose flour and whisk to combine. 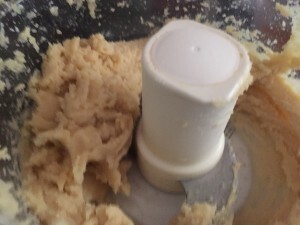 Place the butter in the bowl of a stand mixer fitted with the paddle attachment. Turn to medium-low speed and cream the butter, warming the bowl if needed, until it has the consistency of mayonnaise and holds a peak when the paddle is lifted. Add the sugar and mix, stopping to scrape down the sides and bottom of the bowl as needed, for about 7 minutes, until the mixture is fluffy. 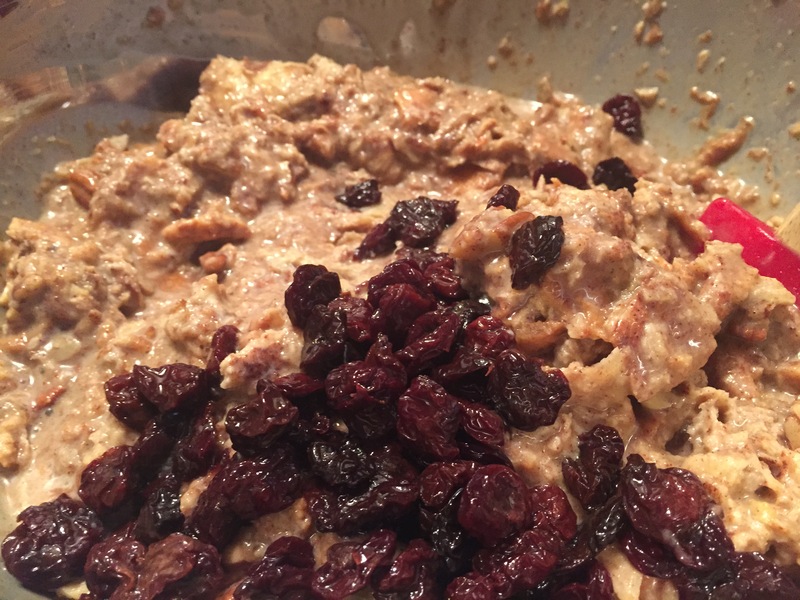 Scrape down the sides and bottom of the bowl. Turn the mixer to low speed, slowly add about one-third of the eggs, and mix until just combined, about 30 seconds. Scrape down the bowl again. Add half the remaining eggs and mix to combine, then scrape the bowl again, add the remaining eggs, and mix for another 10 seconds. 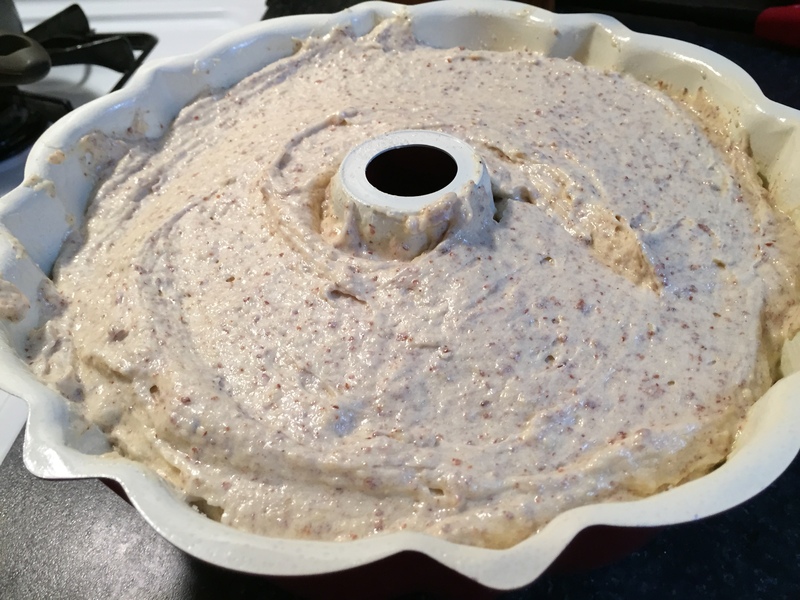 The mixture may look broken, which is fine (overwhipping the eggs could cause the cake to expand too much during baking and then deflate). 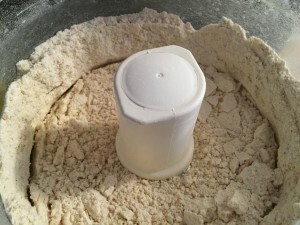 On low speed, add the flour mixture one-third at a time, mixing for about 15 seconds after each addition. Remove the bowl from the mixer stand and scrape the bottom of the bowl to incorporate any dry ingredients that may have settled there. 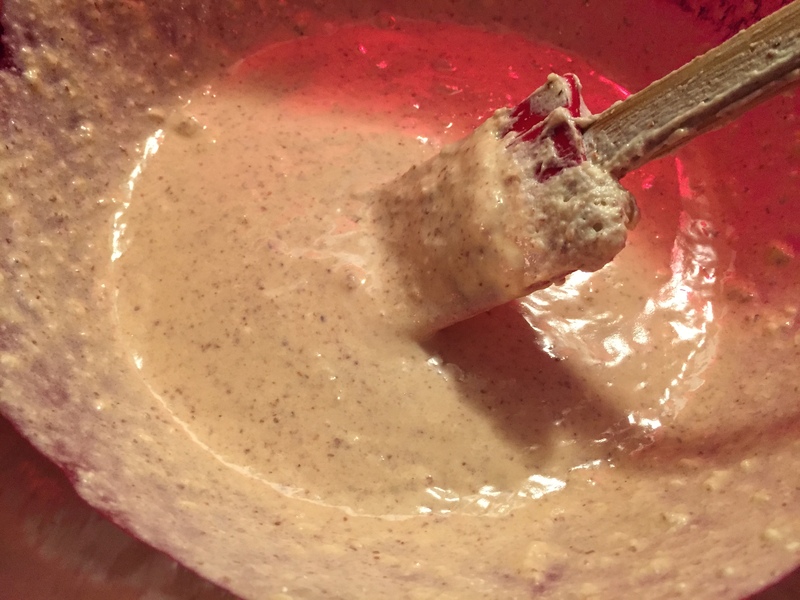 Transfer 1 cup of the batter to a small bowl and stir in the 75 grams/1/3 cup rum until combined. Fold into the remaining batter, combining it thoroughly (the texture of the batter may not be smooth). With a spatula, gently scrape the batter into the prepared pan. Tap the bottom of the pan against the work surface and rotate it back and forth to distribute the batter evenly. 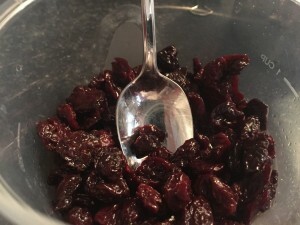 Bake for 55 to 60 minutes in a convection oven, 65 to 70 minutes in a standard oven, until the cake is golden brown (the color may be somewhat darker if you’re not using a cast-iron pan) and a skewer inserted in the center comes out clean. Set the pan on a cooling rack and cool for 10 minutes. NOTE: I had to bake this for close to 75 minutes. I modified the Bouchon version which combines 3 Tablespoons of rum with 3 Tablespoons of simple syrup because I thought it would be too sweet. I also thought it needed more rum. And, indeed, with the density of this cake, it does need it. 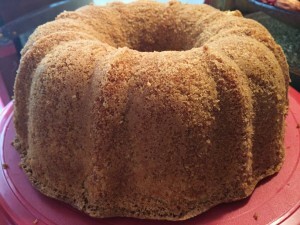 Cool for about 10 minutes, then brush the cake evenly with the rum mixture. Let cool completely. Sift the powdered sugar into a small bowl. Stir in the rum and water until smooth. The icing should be used immediately. The cake is best made a day ahead (store in a covered container at room temperature); it will keep well for up to 3 days. Combine the sugar and water in a small saucepan and bring to a simmer over medium heat, stirring to dissolve the sugar. Remove from the heat and let cool to room temperature, then store in the refrigerator. The syrup keeps indefinitely. 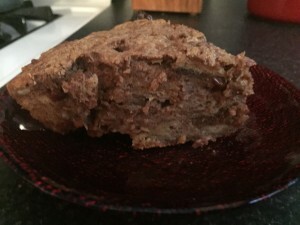 The cake is delicious – a dense, but simultaneously light, texture with a gentle nut and rum flavor.